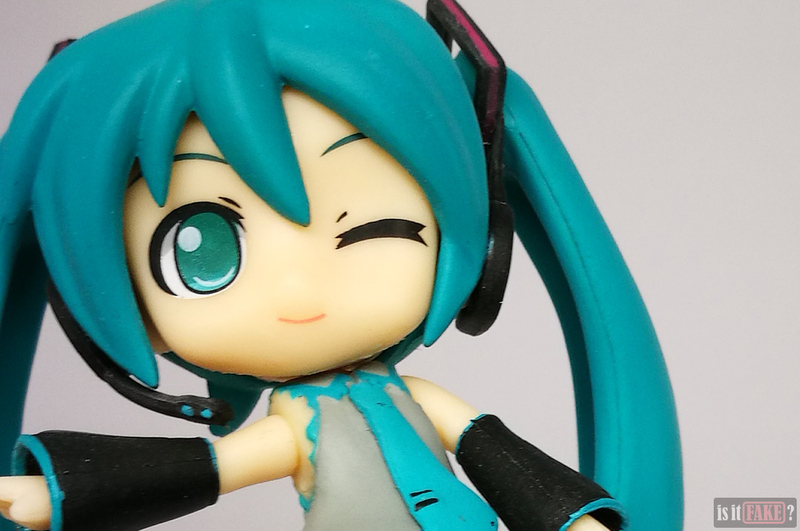 As the “the first sound from the future,” virtual pop idol Hatsune Miku is a gift not only to music and anime lovers, but to culture and technology as well. She is, after all, the foremost non-flesh-and-blood “person” to attain the coveted celebrity status. 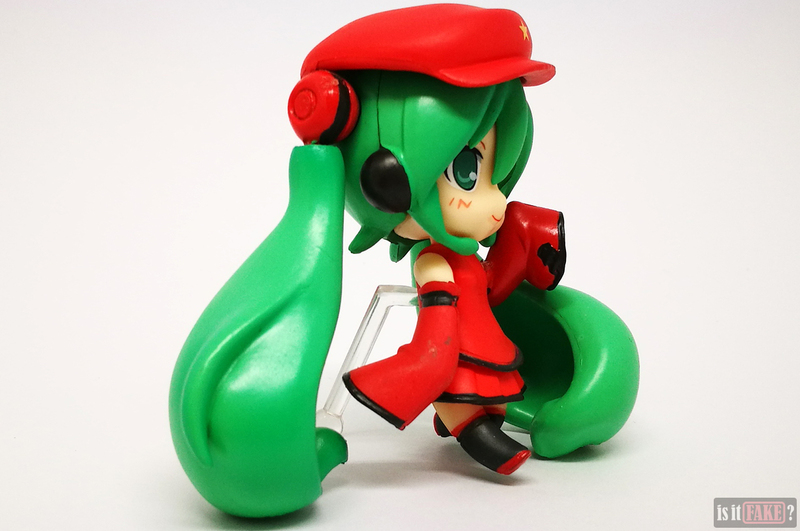 As such, she serves as a testament to the viability of computer-generated artists in the music industry. These days, a fictional character rising to the heights of fame only means one thing: the requisite deluge of merchandise. 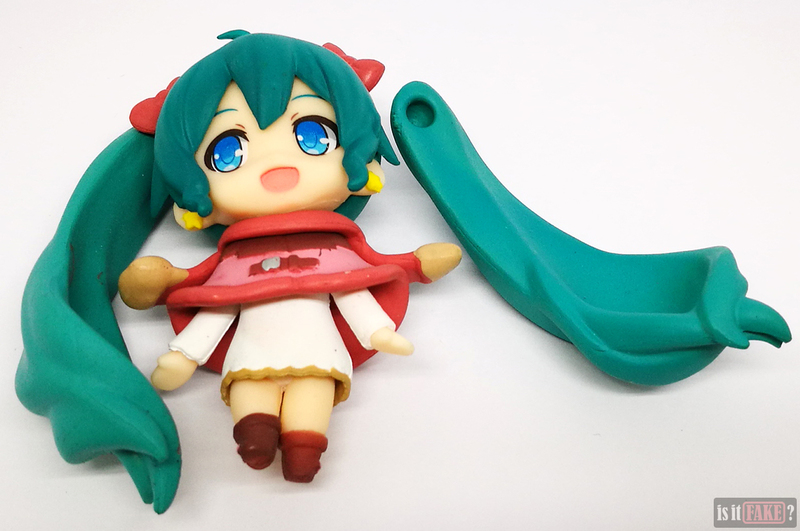 To the delight of fans, there’s enough Miku merchandise for everybody, in part thanks to the efforts of Japanese toymakers. 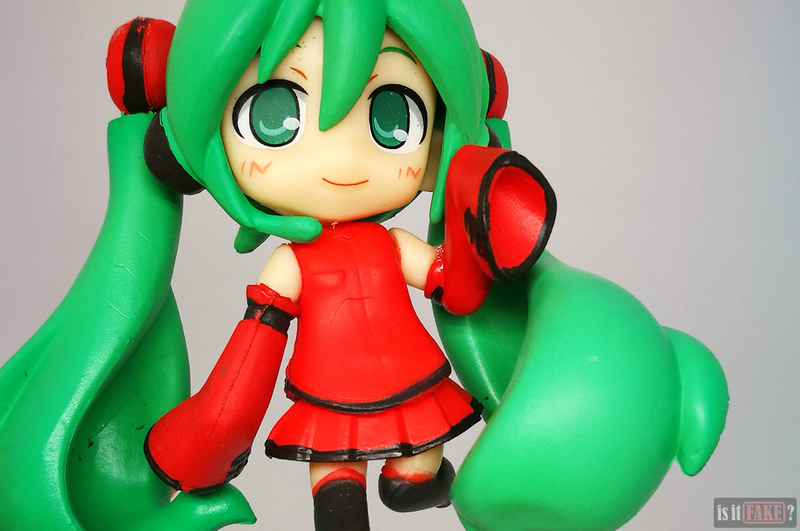 One such company is Good Smile Company, the people behind those adorable Nendoroids and Nendoroid Petites. 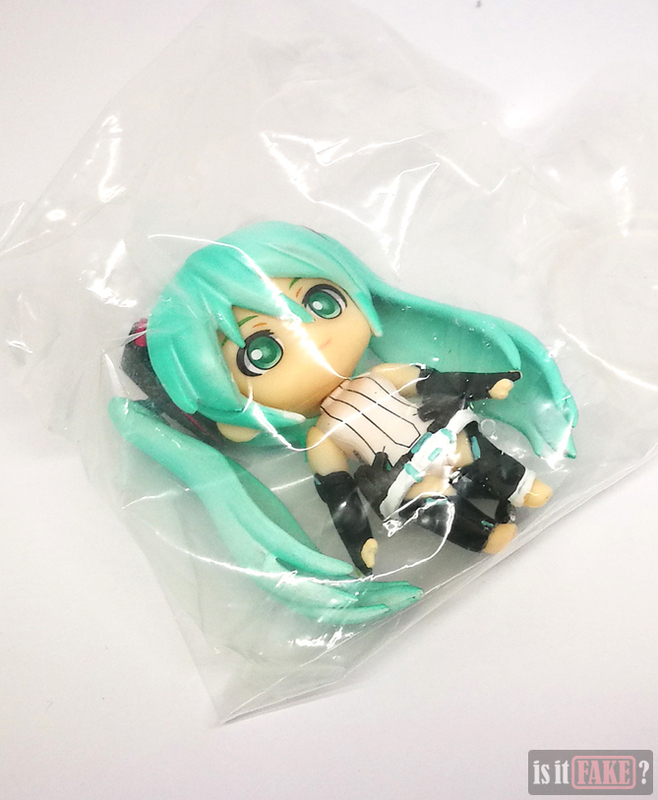 Hatsune Miku Nendoroids have always been highly sought after – a fact greedy pirates have taken to heart. 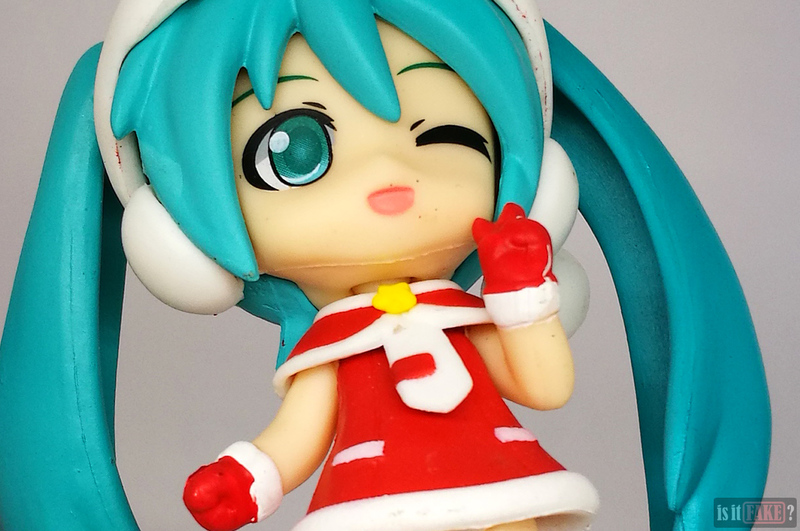 This Christmas season, we therefore present to you our review of 6 fake Nendoroid Petite Hatsune Miku figures – a takedown that will hopefully warm your hearts! Shopping online? See an item you like? Is the product priced so low that you can buy an additional dozen to give to your friends as gifts? If something is too good to be true, it most definitely is. This adage is doubly accurate if the product is being sold on Chinese online stores, which are swarming with bootleggers and suspiciously affordable items (a.k.a. fakes). 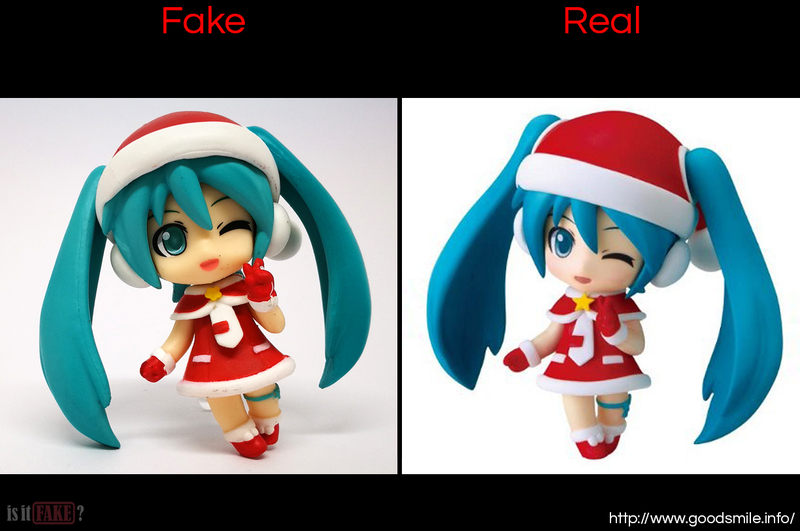 Some counterfeit goods are so deceptive you’ll mistake them for the real thing if you’re not careful. 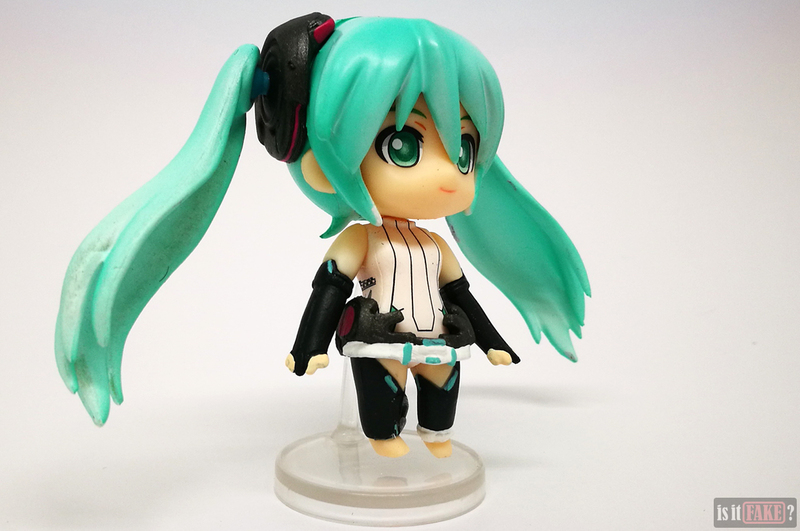 These 6 fake Nendoroid Petite Hatsune Miku Collection figures are excellent examples of such fakes. 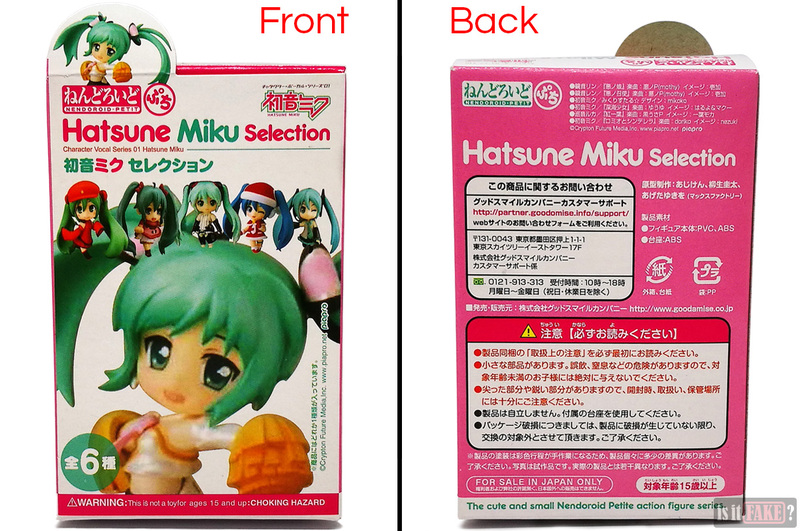 Their packaging even identifies Good Smile Company as the official manufacturer of Nendoroid Petite figures – which is true. What the bootleggers failed to say, however, is that said company was not responsible for these particular low-quality fakes. 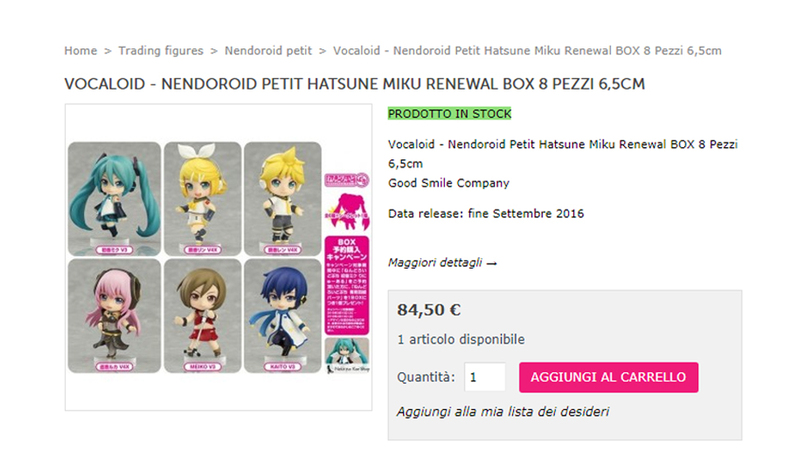 Official Nendoroid Petite figures are generally sold individually, with each box housing a random character. 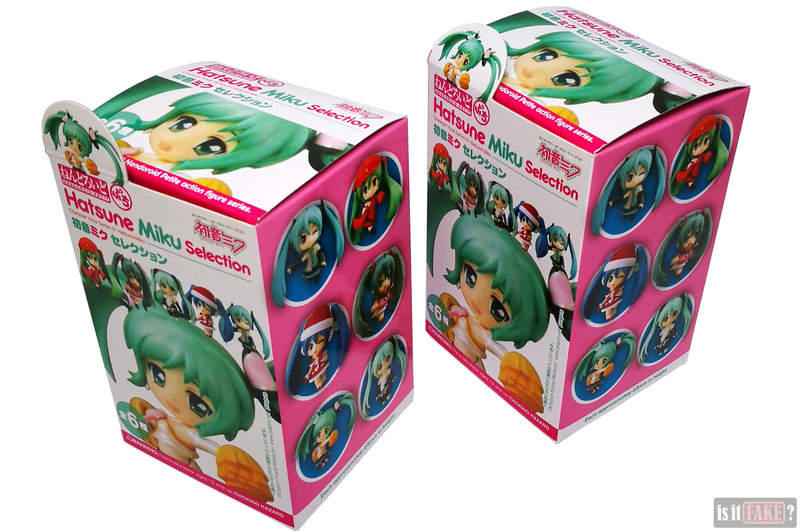 However, some retailers buy all figures in a set and sell them as a set containing every unique character. 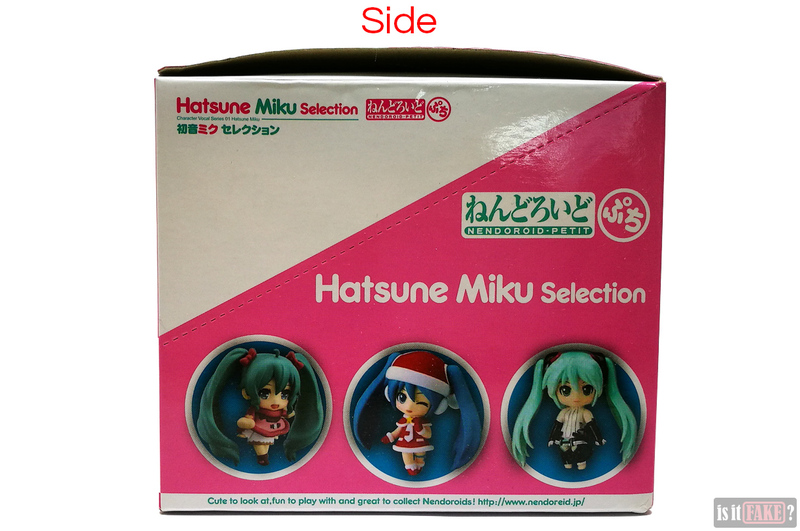 This way, buyers don’t end up with duplicate figures. These 6 fakes are also sold separately, but we purchased them as one set to ensure we could review every character. The set comes in a big box that, aside from looking a little worse for wear, seems very much like an official Good Smile Company product. Often, the first telltale sign that a product is fake is the abundance of Chinese on its packaging. 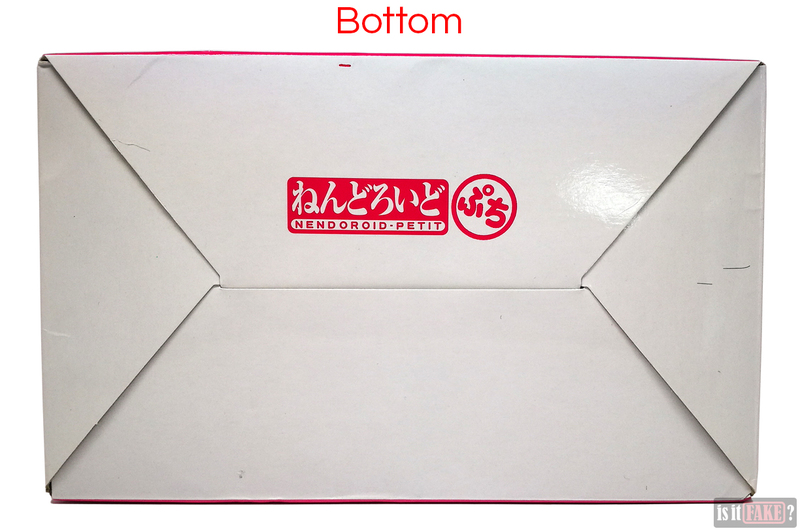 This box, however, is covered in Japanese characters. 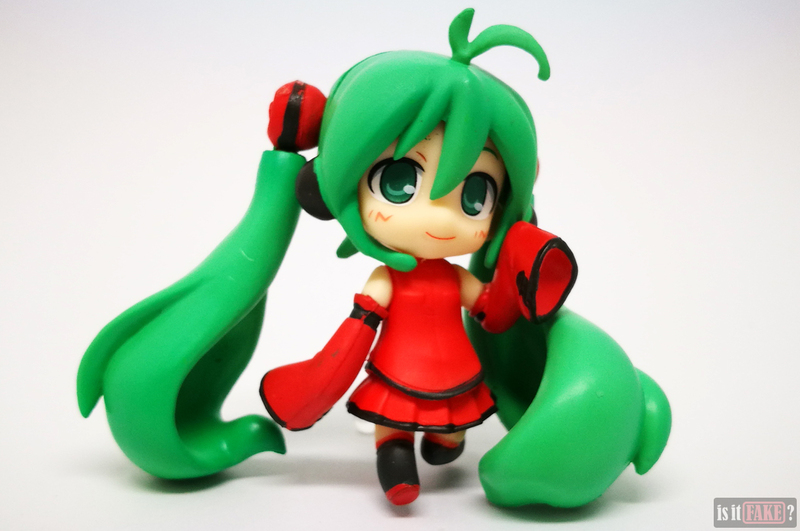 It also makes use of several official symbols, from the Hatsune Miku and Nendoroid Petite logos to the Japanese recycling instructions. 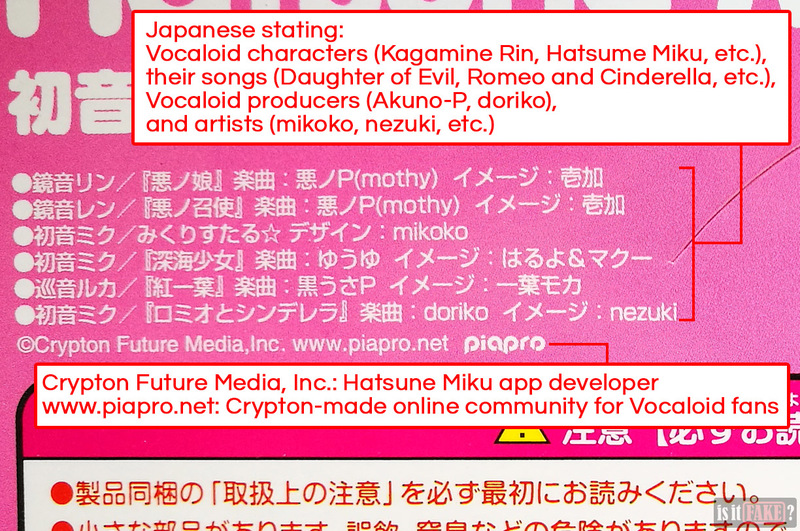 Additionally, not only does the box name the creator of Vocaloid and Hatsune Miku (Crypton Future Media), it also provides links to said creator’s website and the Vocaloid online community they developed, www.piapro.net. But perhaps the bootleggers got a little overzealous with the links. Because if you look real close, you’ll notice something off with the other three links printed on the box. As you can guess, none of the wrong links work. 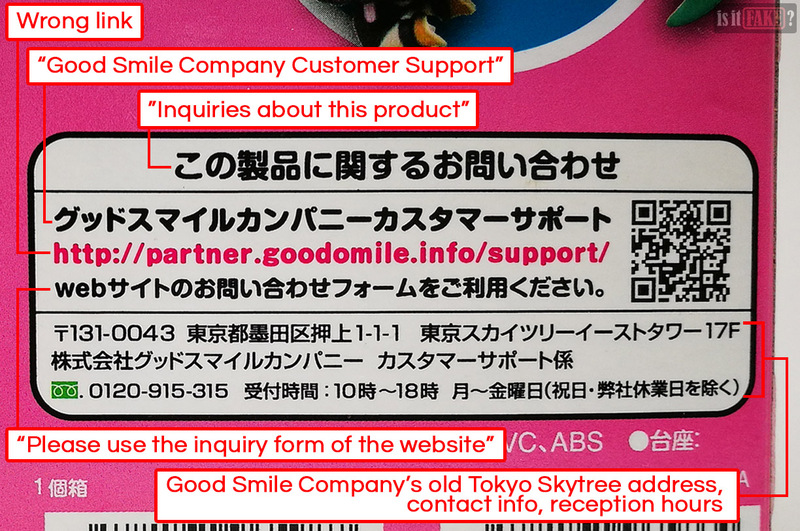 Interestingly, the barcode next to the wrong http://partner.goodomile.info/support link works, and takes you to the customer support page. 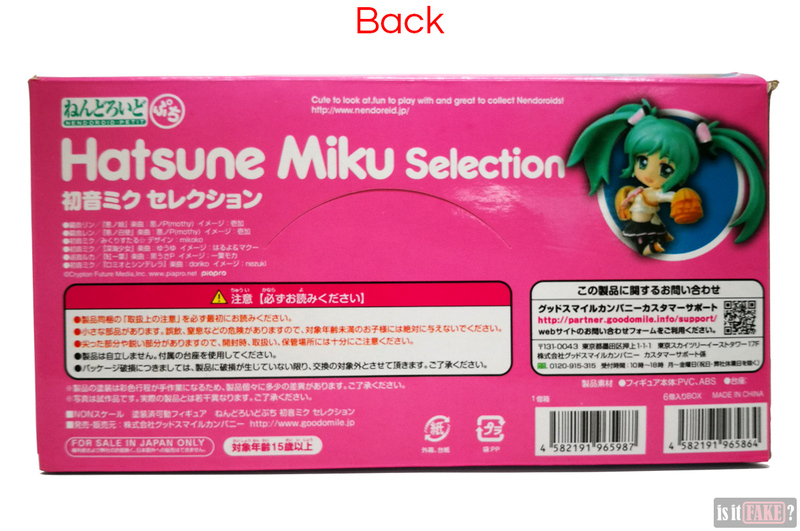 However, the two EAN barcodes at the very bottom don’t yield information related to Nendoroid Petite Hatsune Miku Collection. 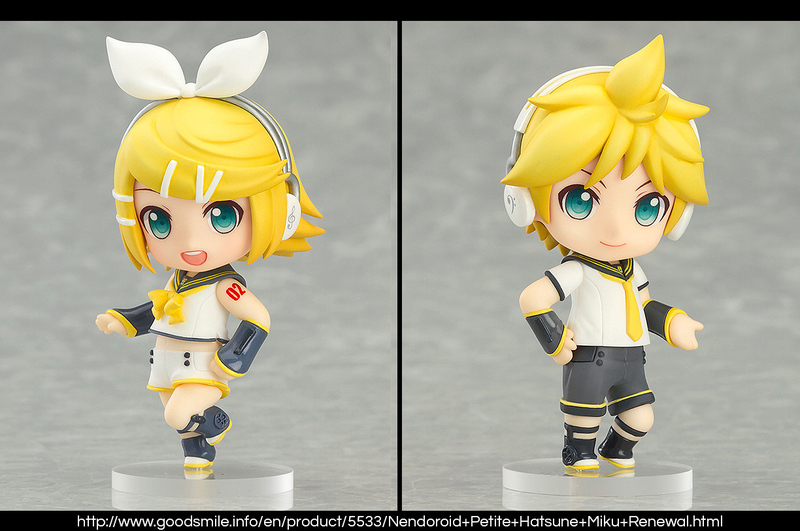 In fact, the results bring attention to two different Good Smile Company products, which you can see here and here. 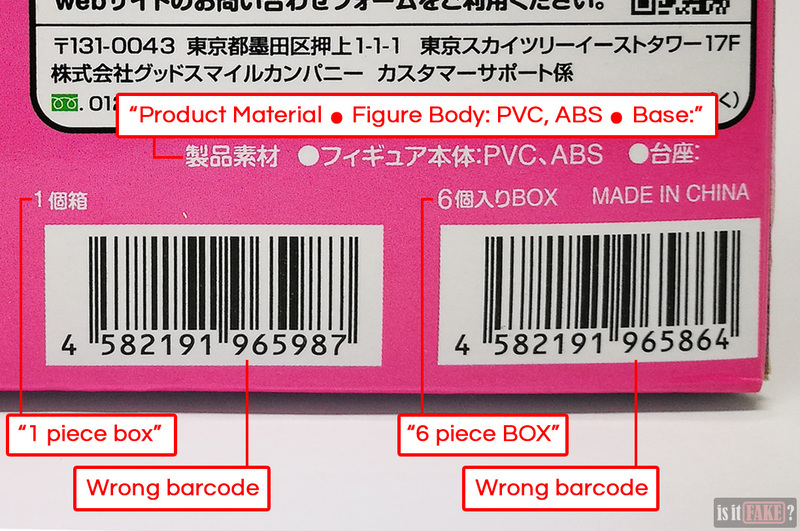 This is a sign the bootleggers simply copied these figures’ barcodes and used them on their fake product’s packaging to make it look legit. 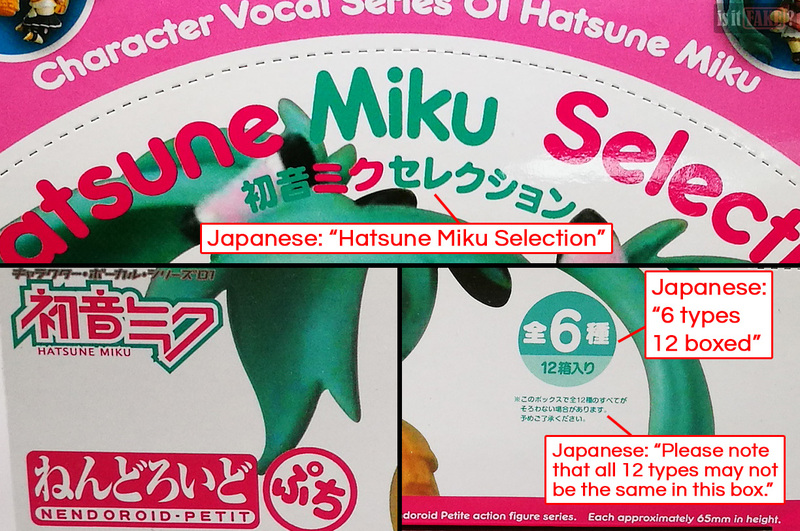 As for the correct-looking Japanese text on the box, it’s possible they copy-pasted these onto their own design from an official product’s packaging, or they have someone on the team who is an expert in Japanese writing. 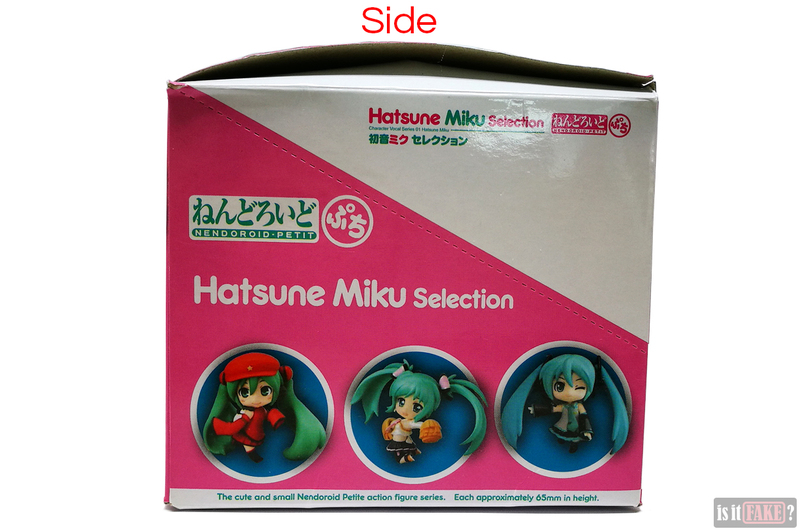 Inside the big box are 6 smaller boxes, one per unique figure. The small boxes repeat all the information printed on the big box. 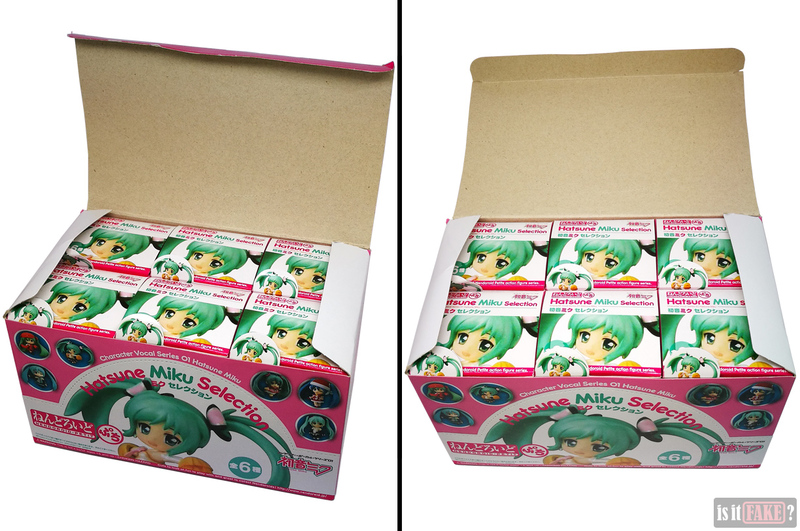 The Good Smile Company logo is nowhere to be seen on the big box, or any of the smaller boxes – a huge oversight on the part of the bootleggers. 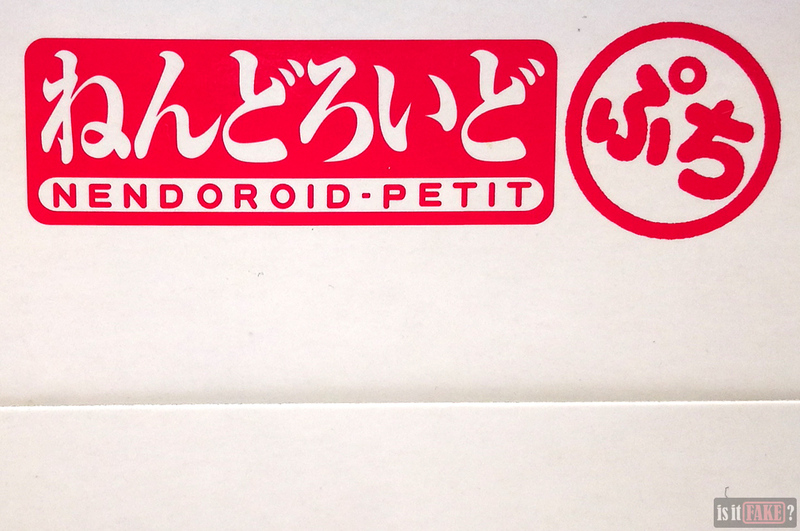 As Good Smile Company is the official manufacturer of all Nendoroids, their logo should be printed on these boxes. 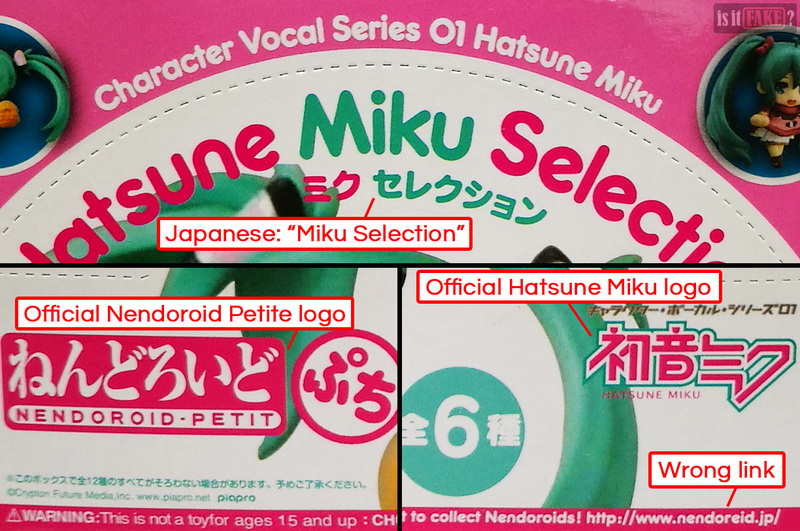 This is the case with all official Nendoroid Petite products, as you can see in unboxing videos on YouTube, such as this and this. 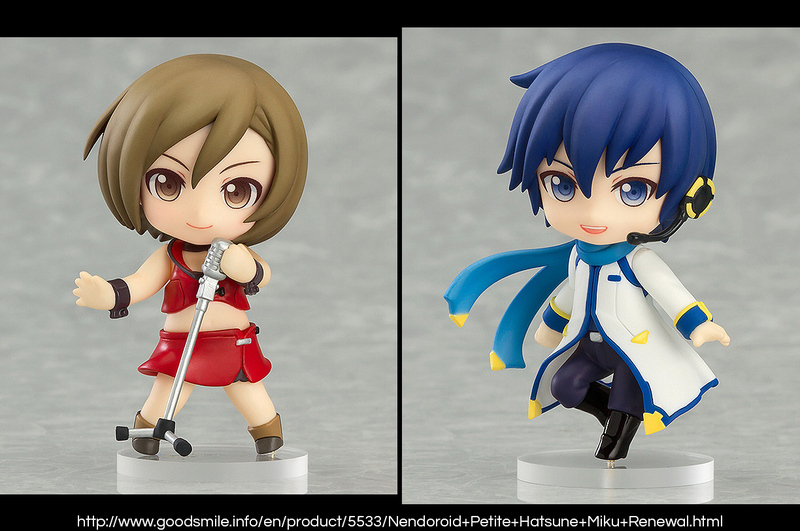 Like official Nendoroid Petite figures, each fake approximately stands 65mm. 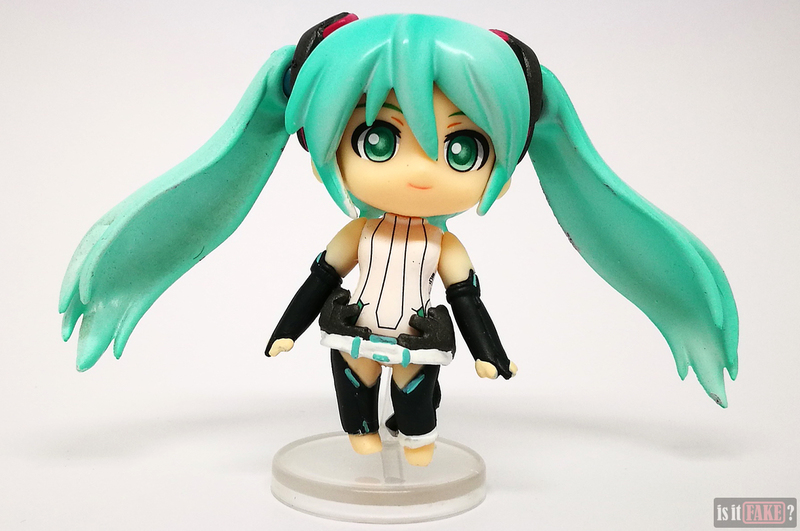 The first is Hatsune Miku in a futuristic bodysuit. 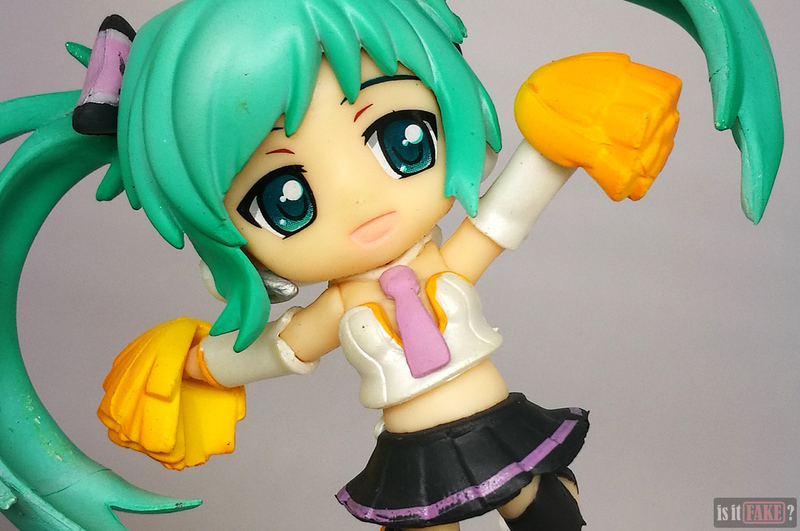 From the photos, it’s fairly obvious how dirty this figure is. 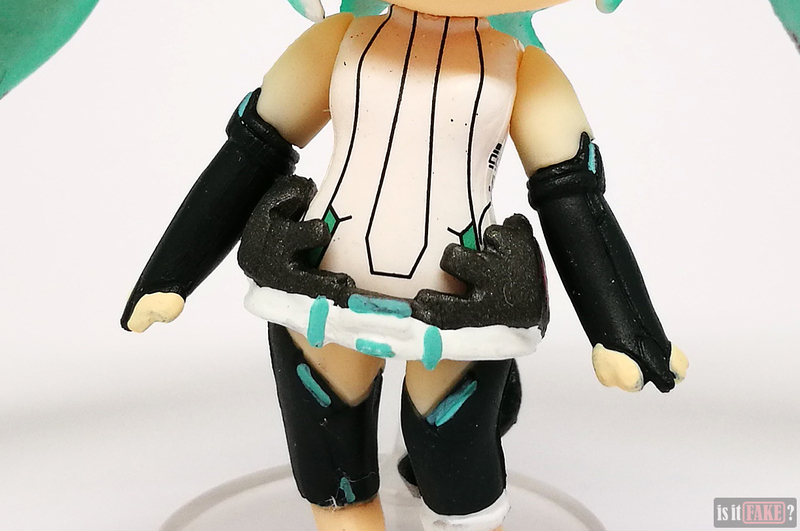 The black and brown stains are most noticeable on her hair, but you’ll also spot dots on the white portions of the bodysuit. The paint apps are untidy, as well, with colors leaking between sculpted details. Speaking of the sculpt, it generally lacks refinement. What should be sharp edges are instead blunt, and the tips of the hair are rounded instead of pointed. 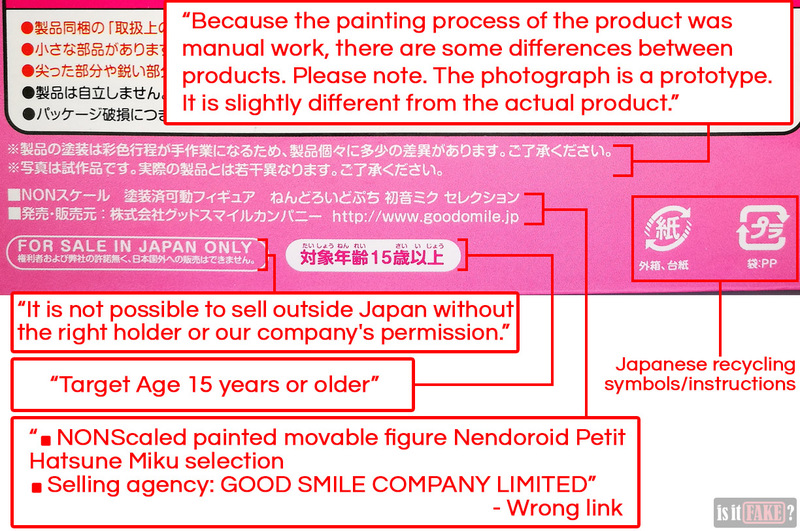 This fake appears to be a reproduction of an official Good Smile Company product, which you can see here. 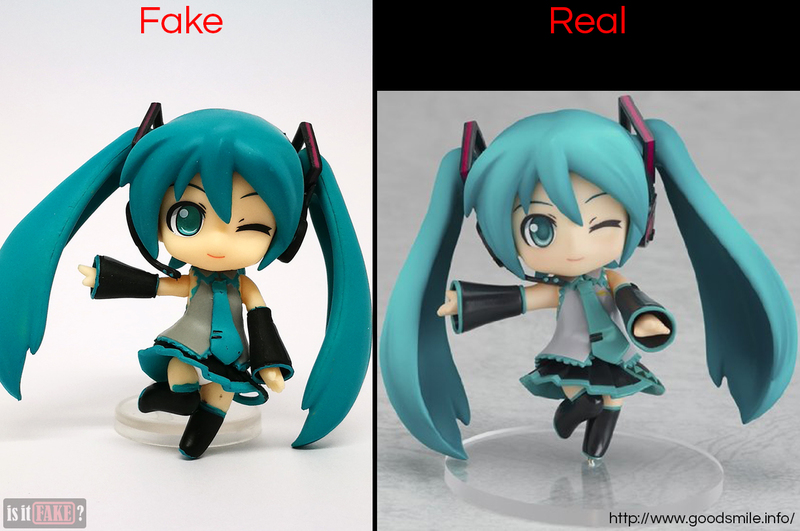 If you compare the fake with the original, you’ll observe the differences that make the latter such a superior item. 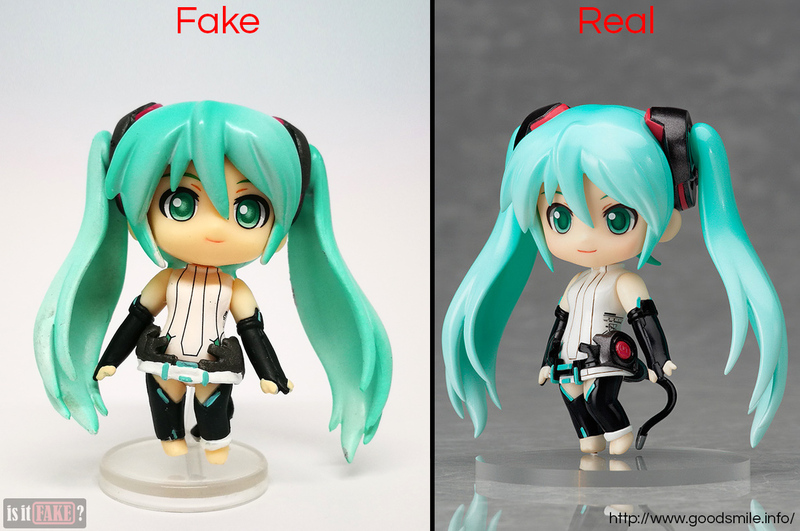 Not only does the original have a cleaner, more beautiful paint job, the figure also has additional features. For instance, the black portions of her suit are smooth and shiny. The belt and the attached black gadgets boast far more detail, in contrast to the fake’s ugly, shapeless lumps. The original’s eyes are brighter, and the pupils are outlined in black. This gives them a more life-like appearance. Overall, the original is also less yellow, making it look brand new as opposed to the fake, which looks like it’s been in storage for ages. Now let’s talk about the figures’ stands. 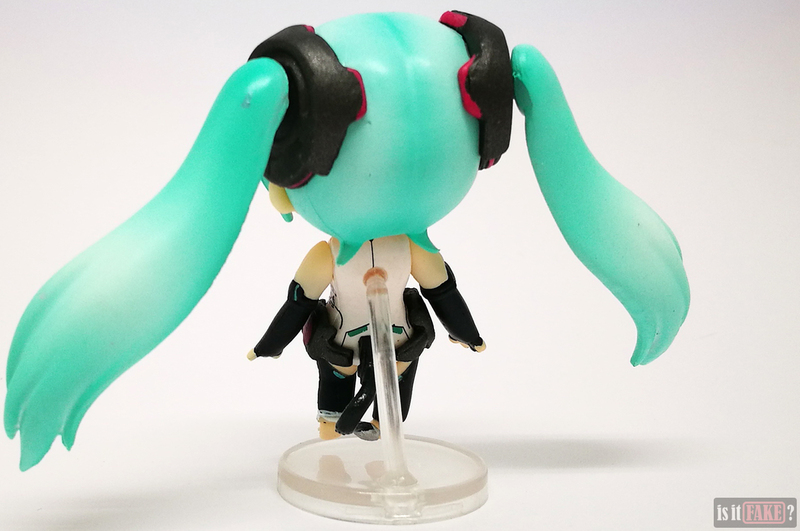 Each stand is composed of two parts: the disc-shaped base itself and a clear plastic hook that connects the base to the figure. 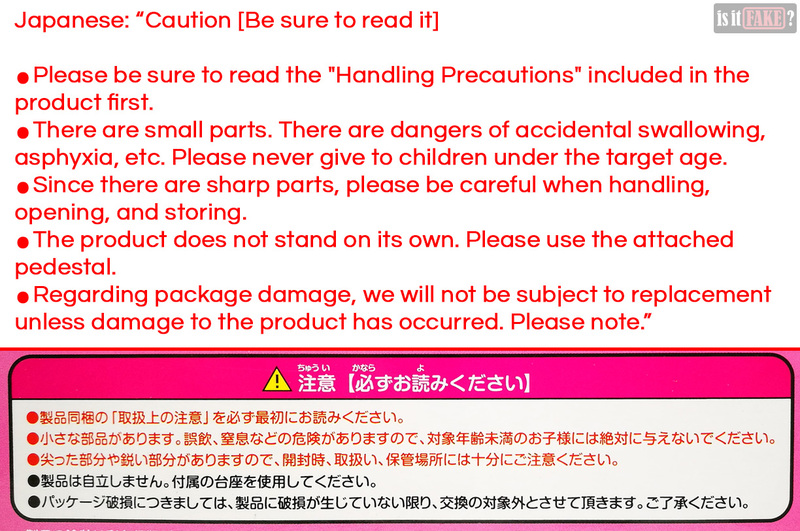 But there’s a huge problem with the fake stands. 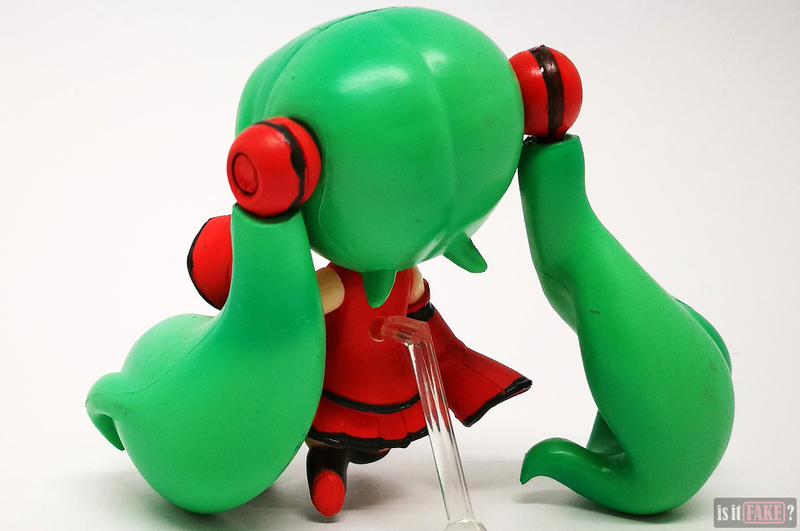 The ball at each end of the hook is too large for the hole in the base and the figure’s back. 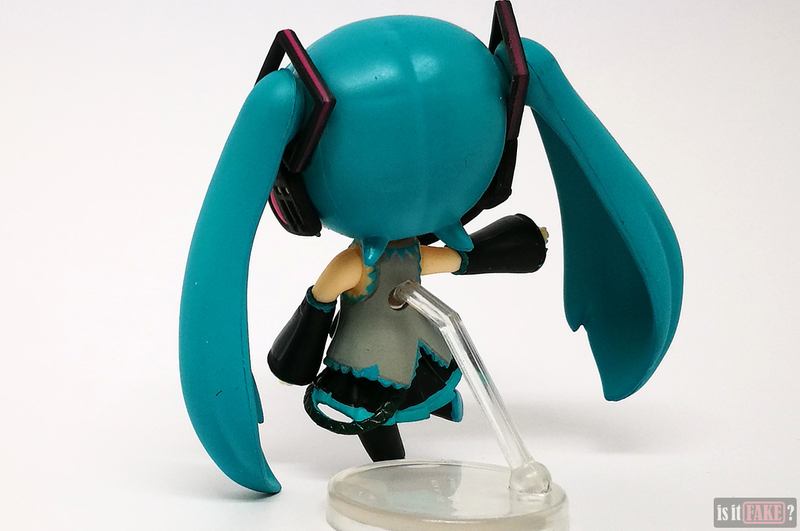 Because the figure’s plastic is soft, you can force the sphere into the hole in its back. The base, however, is stiff, so no amount of pressure will fit the ball into its hole. 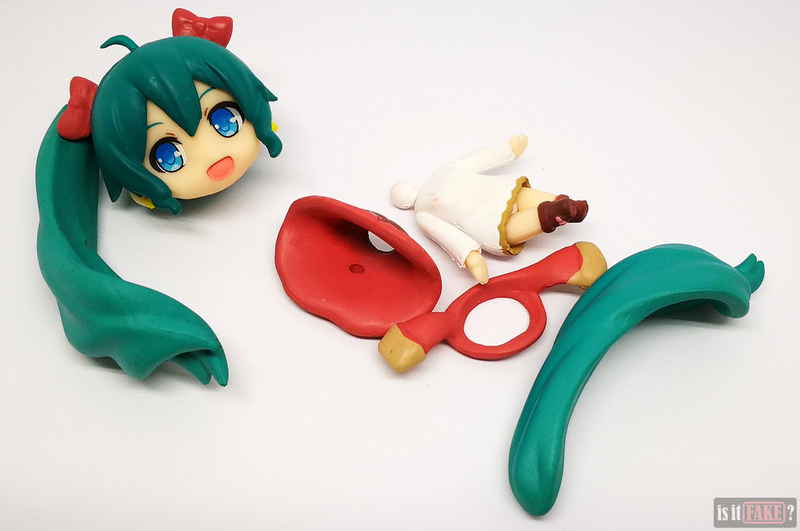 With the exception of the figure we just discussed, all the fake figures come with bases with holes that are simply too small. Because there’s no way to attach the hook to the base, 5 of these 6 figures have to make do without bases. Let’s move on to the next figure. 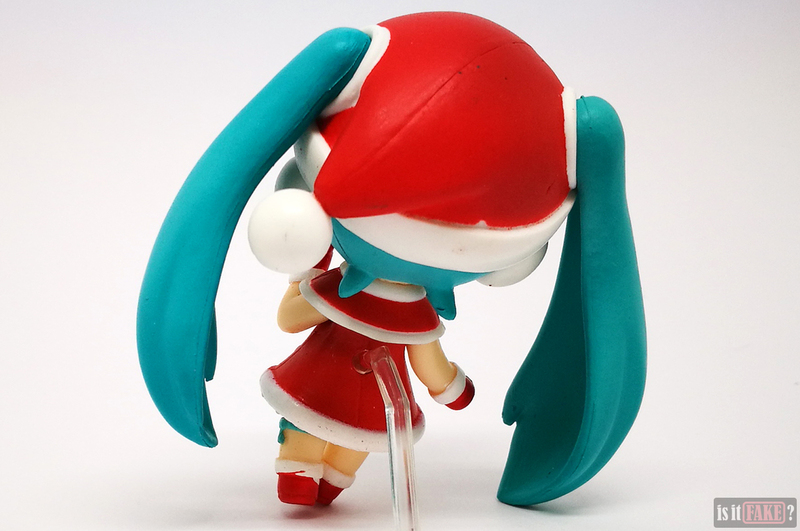 While the second figure’s hair is cleaner, its clothes suffer from an even worse paint job than the last. The dress is a mess, with paint slop and dirty spots everywhere. The pink shapes on the headphones are crudely painted. 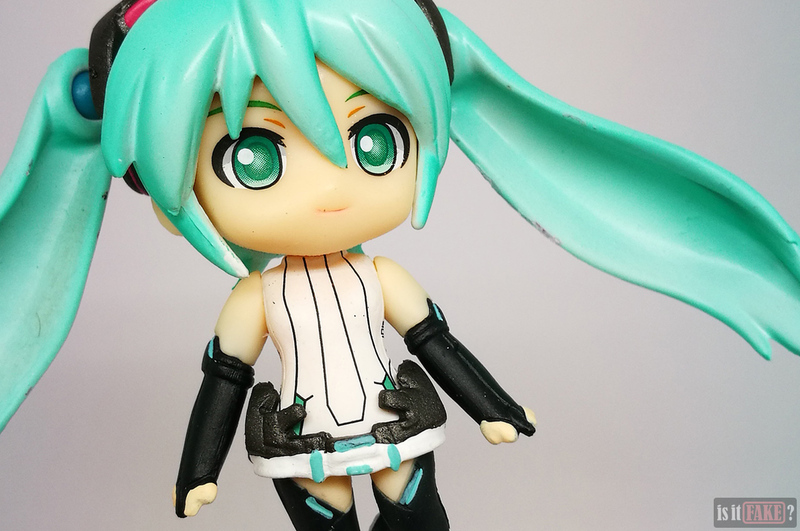 The sculpt is marked by several flaws and blemishes. For instance, the line below the chin was not cut cleanly. 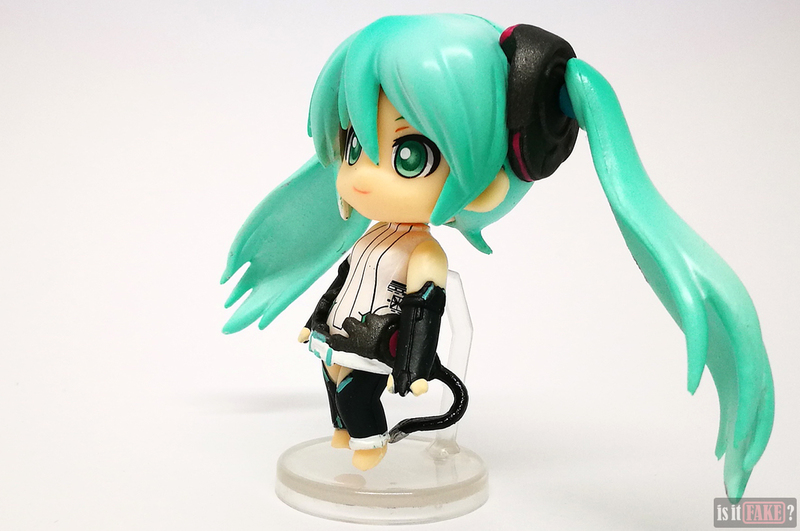 This has left behind some excess plastic that makes Miku look like the victim of a botched facelift. This figure’s hook and base demonstrate the problem we discussed previously. As you can see in the images above, the hook’s ball is far too wide to fit into the base’s hole. 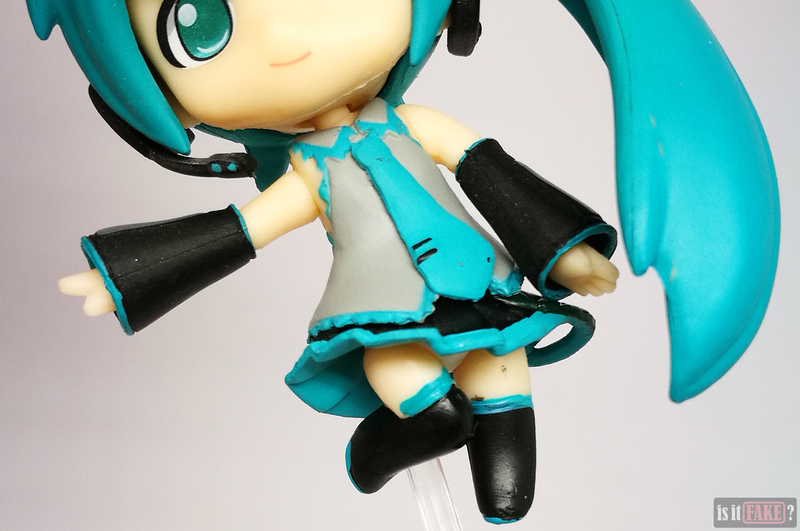 To prevent this figure from tipping over, setting it up for display is therefore a constant balancing act. 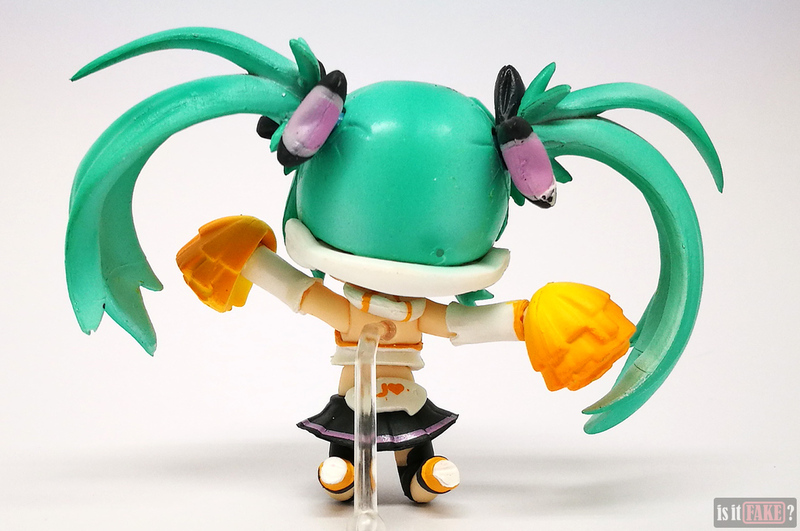 This fake was based on an original figure that came with the limited edition of the Nintendo 3DS game Hatsune Miku and Future Stars: Project Mirai. The original’s costume has shiny black sleeves and socks, and an overall cleaner and lighter color scheme. The eyes also feature more detail. We see more sculpt and paint issues on this third figure. Most evident are the lumps, dents, and red paint stripe on the hair. 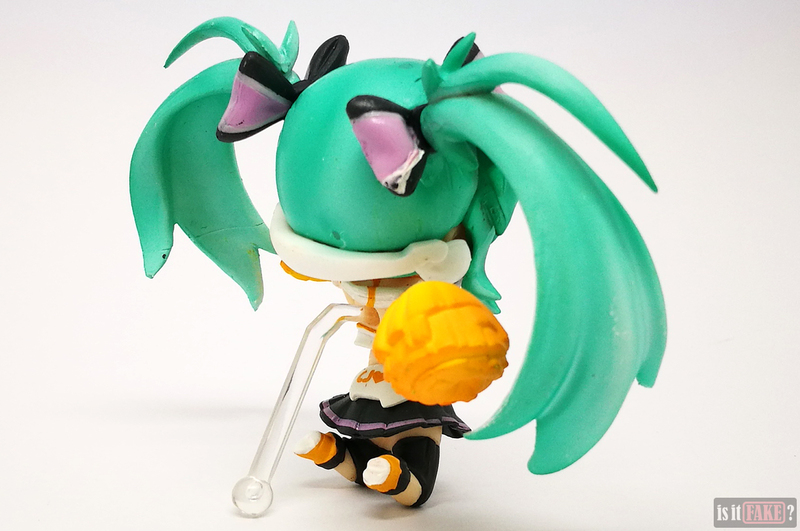 The left pigtail also has trouble attaching to the main hairpiece, thanks to a hole that’s too small for the sphere. 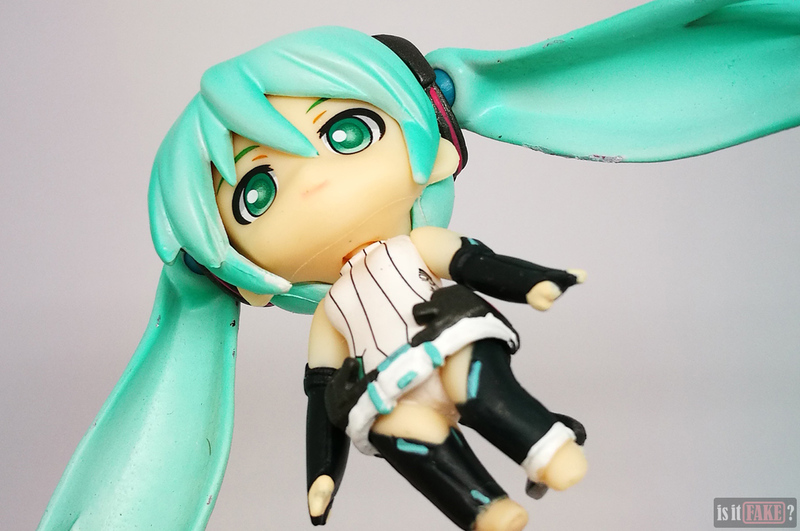 You’ll have no choice but have Miku go without it. 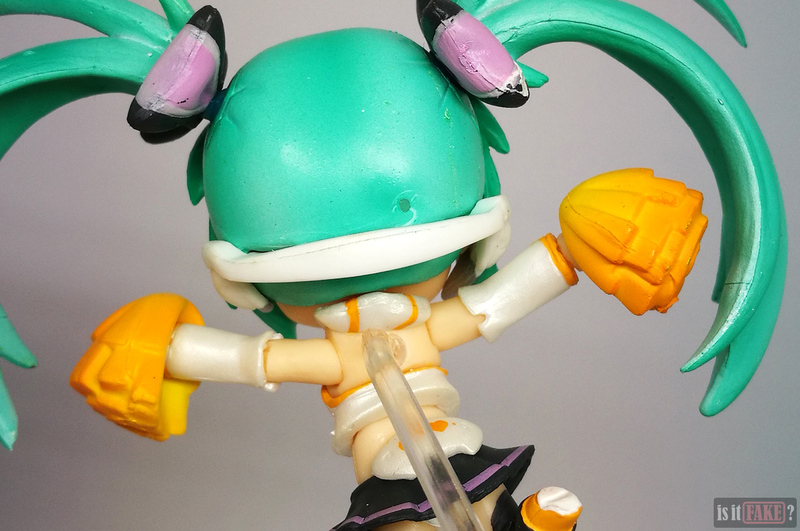 While the pigtail is too tight, the figure’s other parts are quite loose. 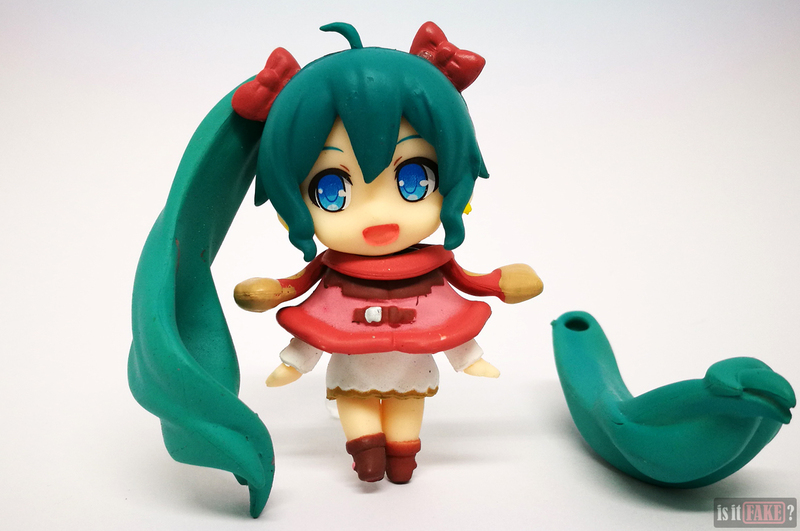 This Miku has to be handled with extra care lest she fall apart. 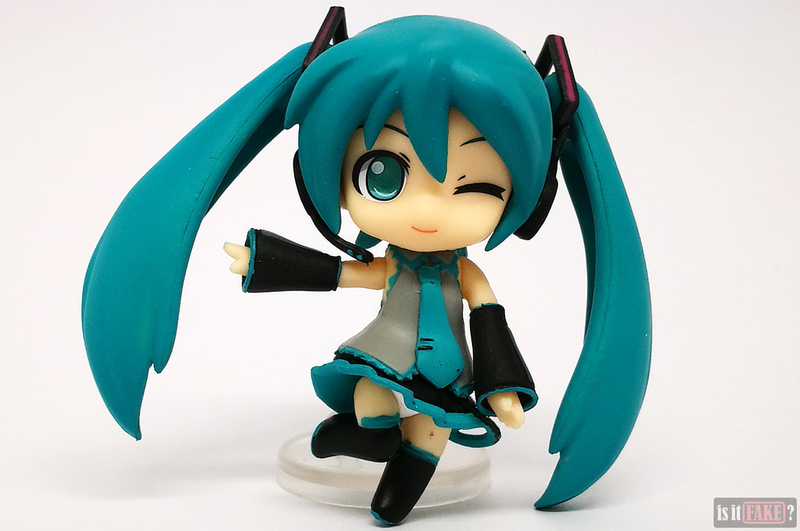 This fake is another reproduction of a far superior Nendoroid Petite. 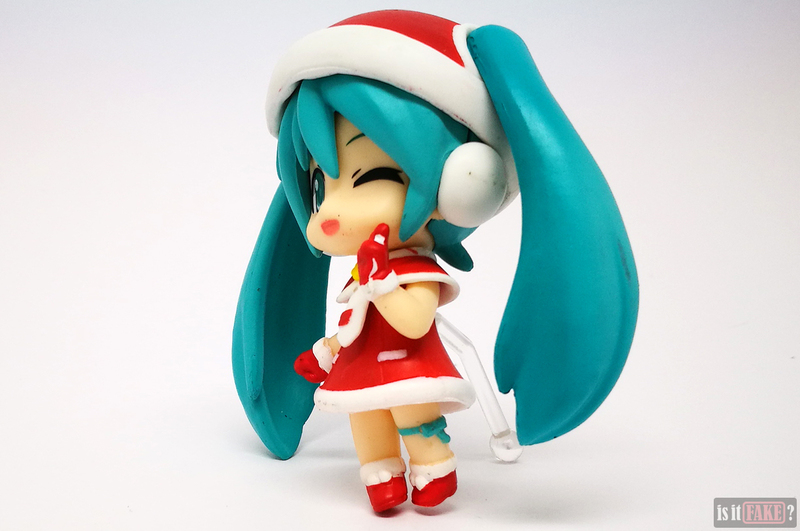 The original was a limited exclusive called Hatsune Miku Christmas Date version. 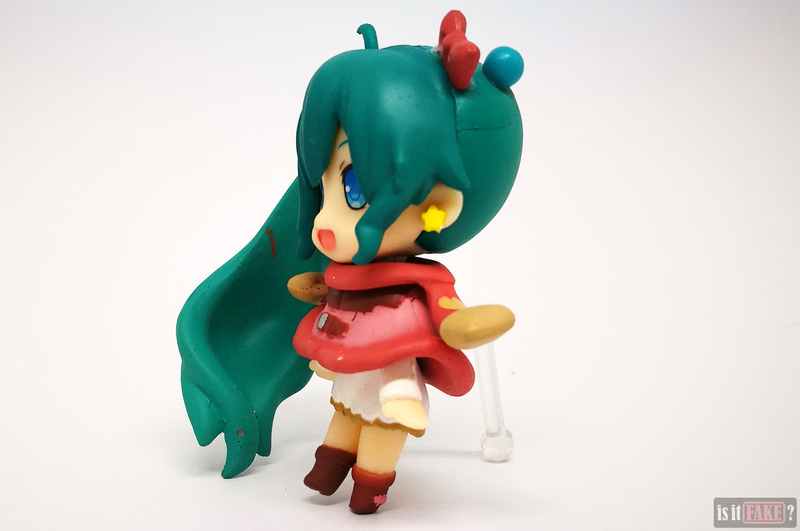 It has cleaner and lighter colors, and a scarf that’s shaped slightly differently. 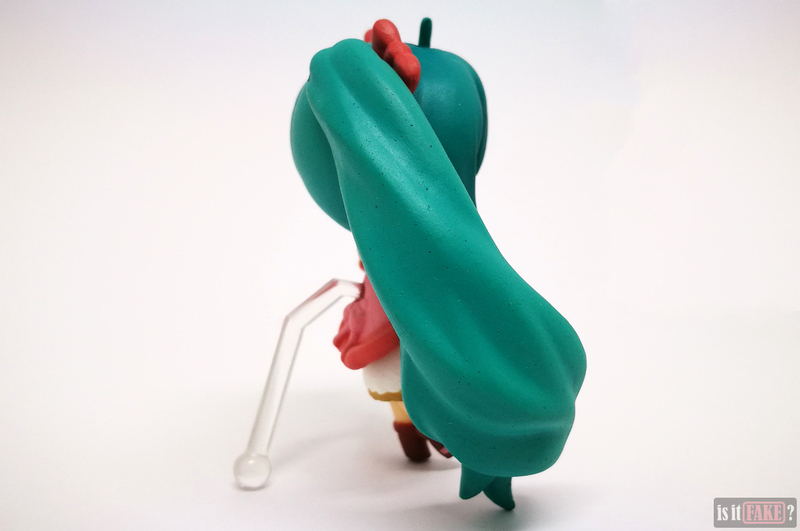 This figure’s hair is a nightmare, complete with ghastly brown stains, as well as numerous sculpting issues such as visible lines and excess plastic. 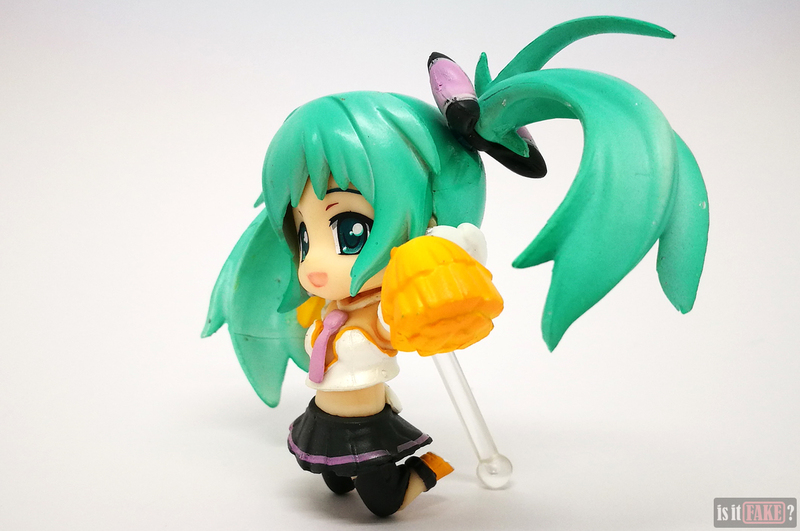 The hair ribbons also look terrible, thanks to the sloppy paint job. 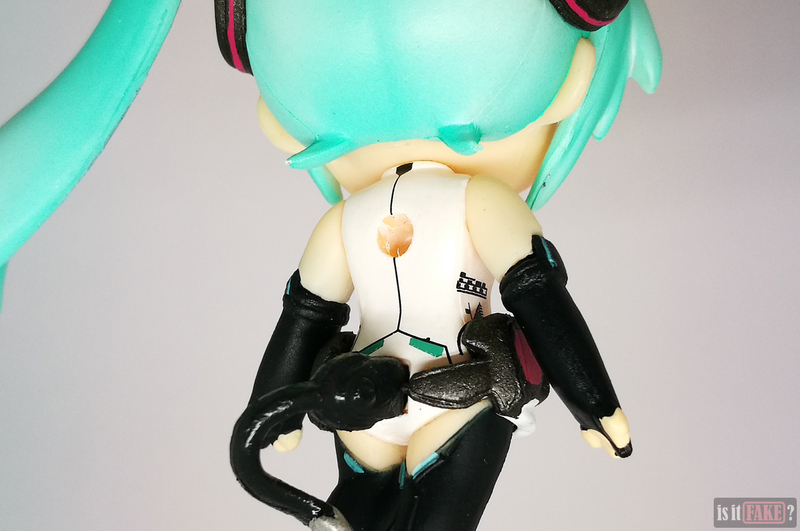 Among other problems, the purple paint on the front of the skirt is poorly applied, and the hook’s ball is once again too large for the base. 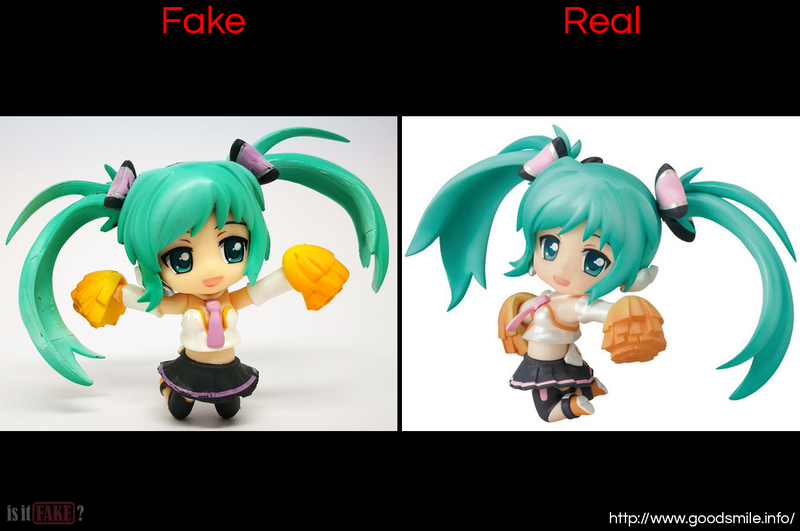 This fake is a copy of the special Nendoroid Petite Hatsune Miku Cheerful version. 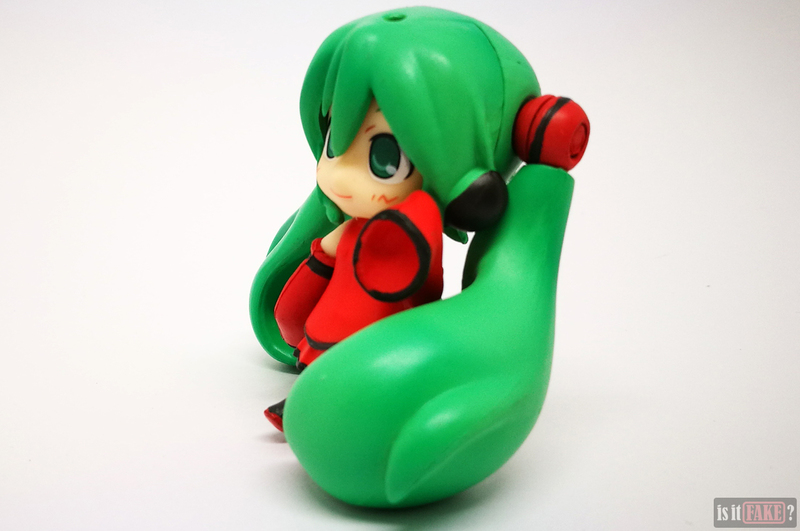 The original was part of the Great East Japan Earthquake reconstruction assistance project, and was given away as a prize for a PIXIV contest. Among the many differences between the fake and original, you can see that the former’s yellow parts (such as the pompoms) are all orange in the latter. This next figure boasts all the problems we’ve discussed so far. 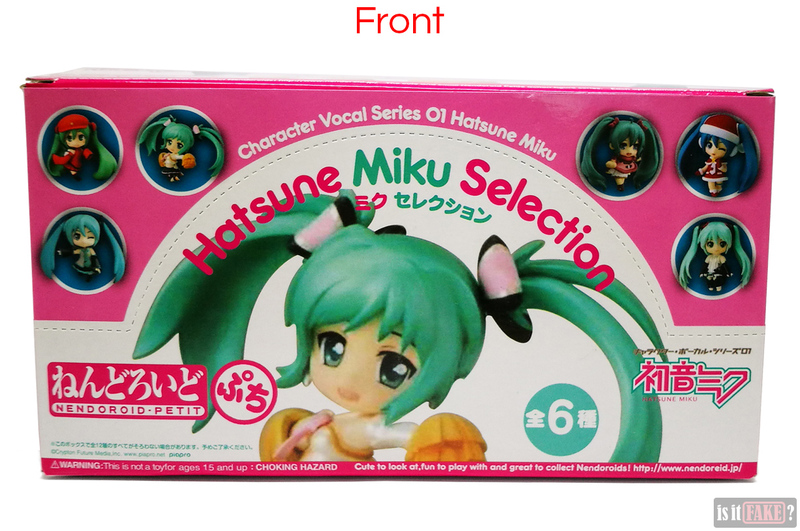 This fake is an imitation of another limited edition figure called the Nendoroid Petite Hatsune Miku HMO version, which was bundled with a Hatsune Miku Orchestra music CD album. You can read about this special figure here and here. 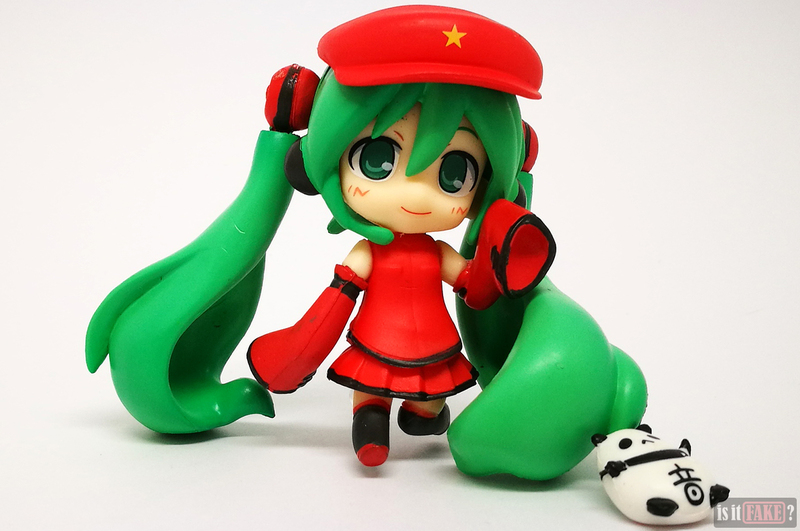 Both the fake and the real figure come with a tiny panda accessory. 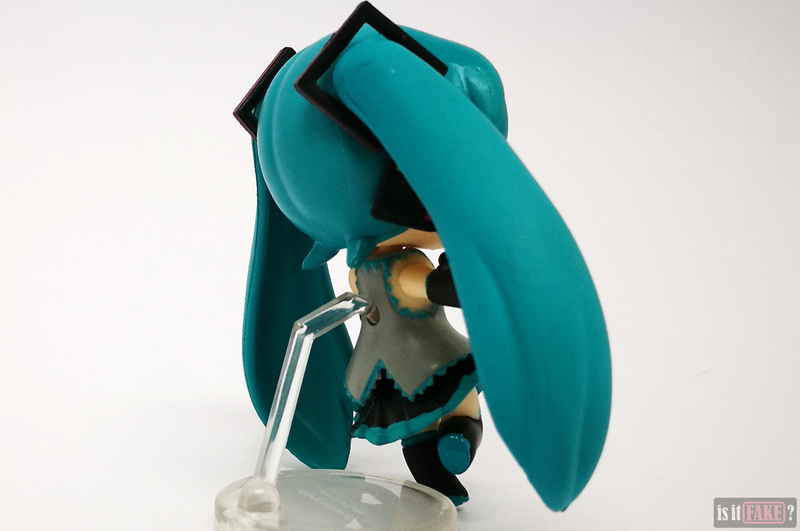 With the official figure, the panda attaches to Miku’s back and becomes a backpack. 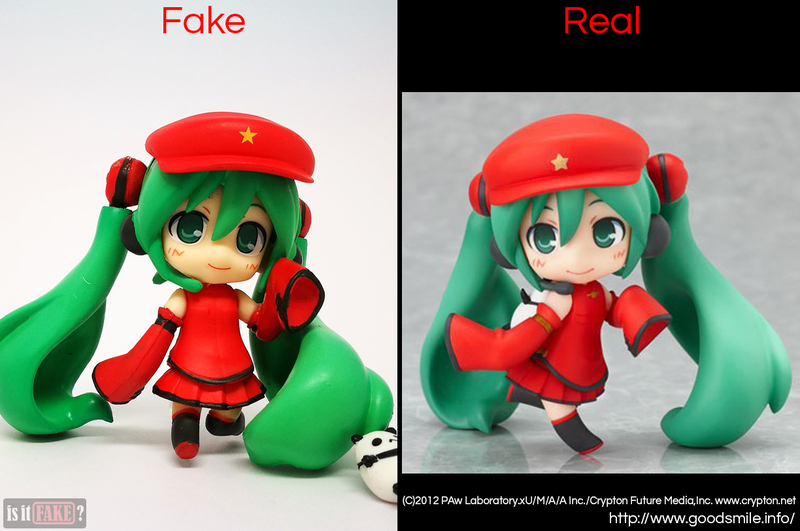 The fake panda, however, has no way to affix itself to fake Miku. It therefore serves no other purpose than to waste space. Because it’s so small, it’s also easily lost. 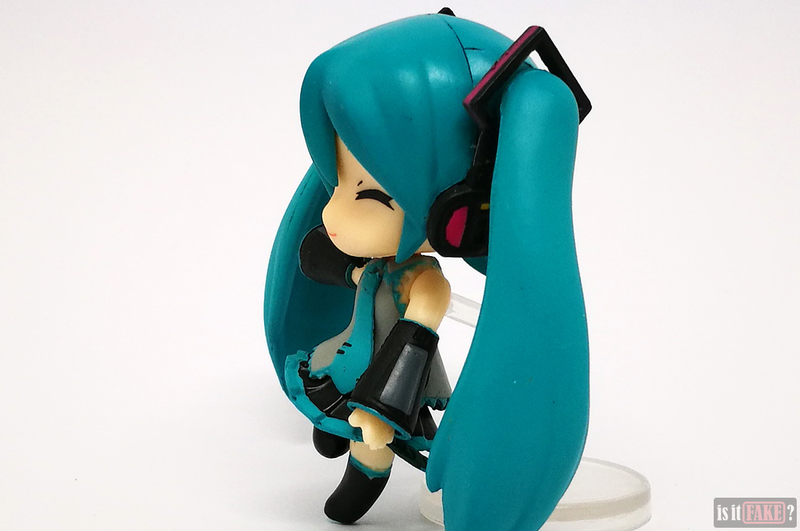 The original figure has no need for a stand because the two pigtails and right foot touch the ground and serve as Miku’s support. In contrast, the fake’s right foot hovers just above the ground. This last figure is hurt by the same issues as the other figures described above, except in this case, the problem with the base makes everything so much worse. 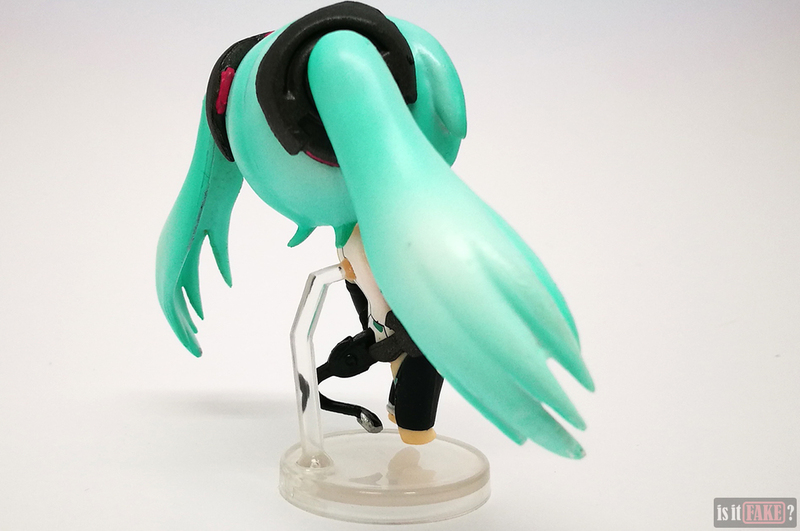 Unlike HMO Miku, this Miku’s pigtails are too short for both of them to reach the ground and serve as the support to keep the figure standing erect. 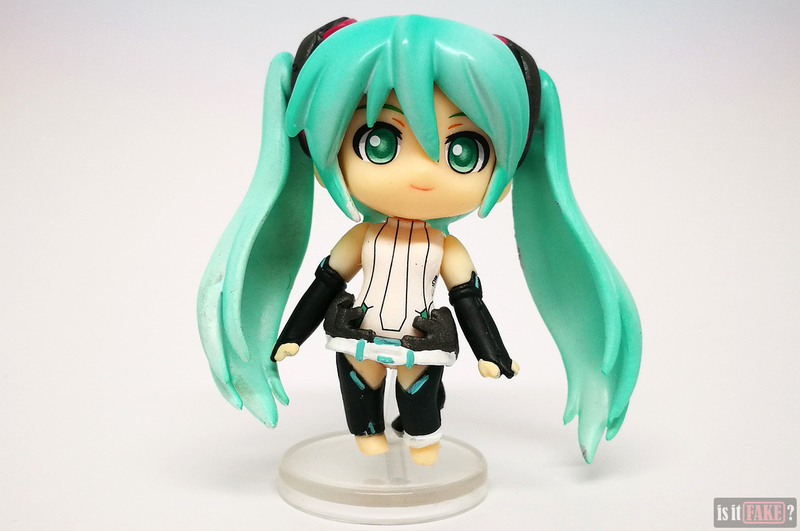 As a result, this figure will always be tilted to one side. 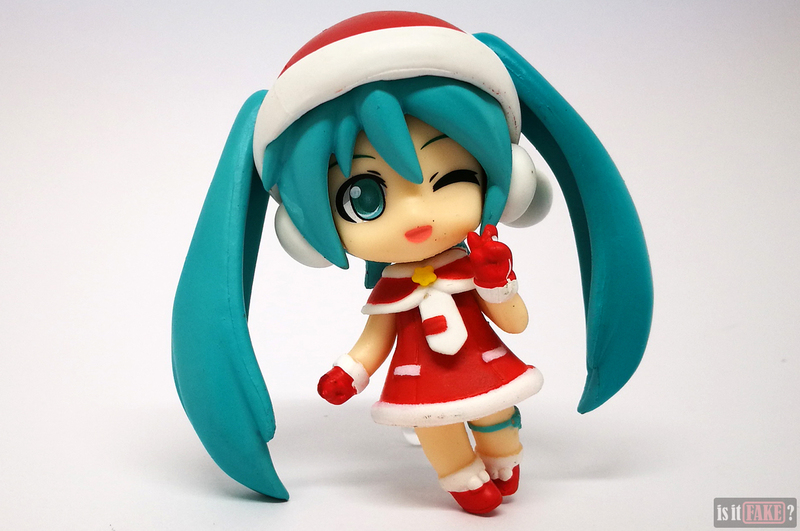 It’s like Miku is perpetually inebriated, which, in a way, makes sense, given it’s Christmas. Who knew everyone’s favorite virtual idol was such a heavy drinker? 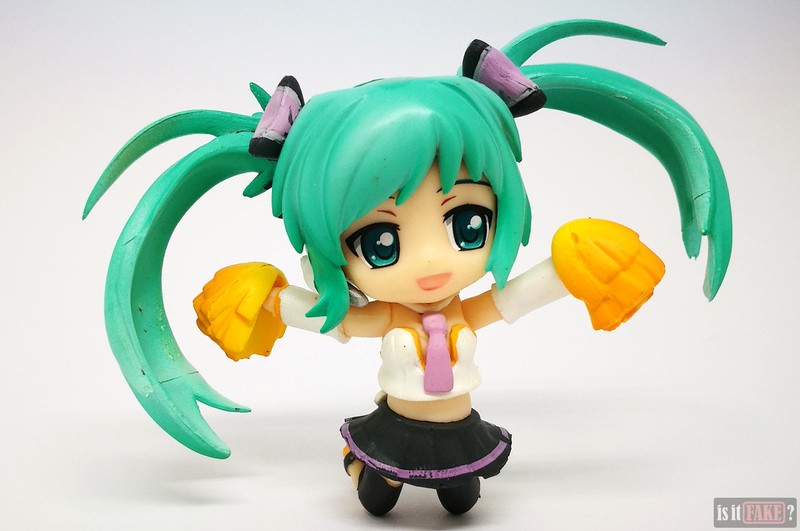 Like the other figures in the set, this Miku is a shoddy replication of a limited exclusive. 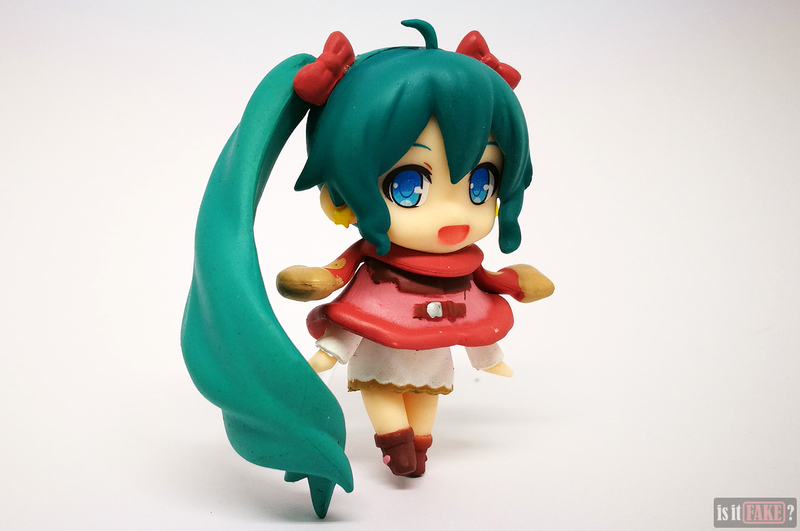 In 2013, FamilyMart issued a log house-shaped cake that came with a Christmas-themed Miku. You can check it out here. 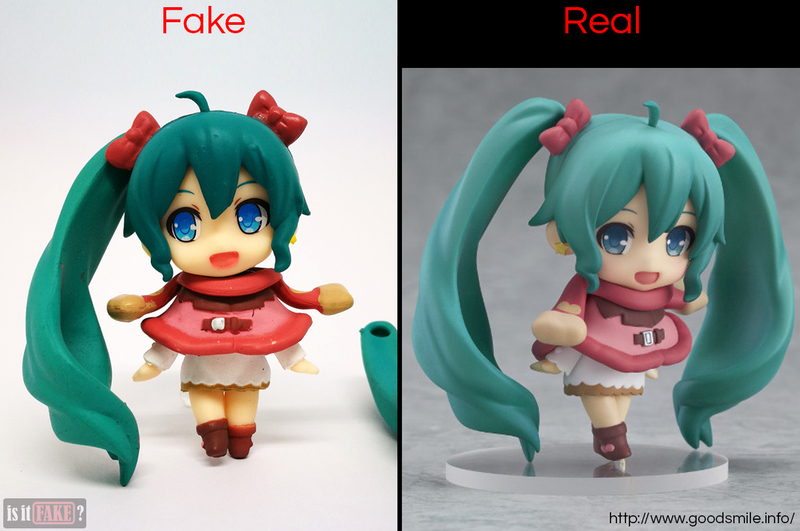 Among the usual differences in paint and sculpt quality, the original figure’s hair is blue as opposed to the fake’s greenish blue. The star on the original’s chest also has sharper points, and her tie is shaped like an actual tie. 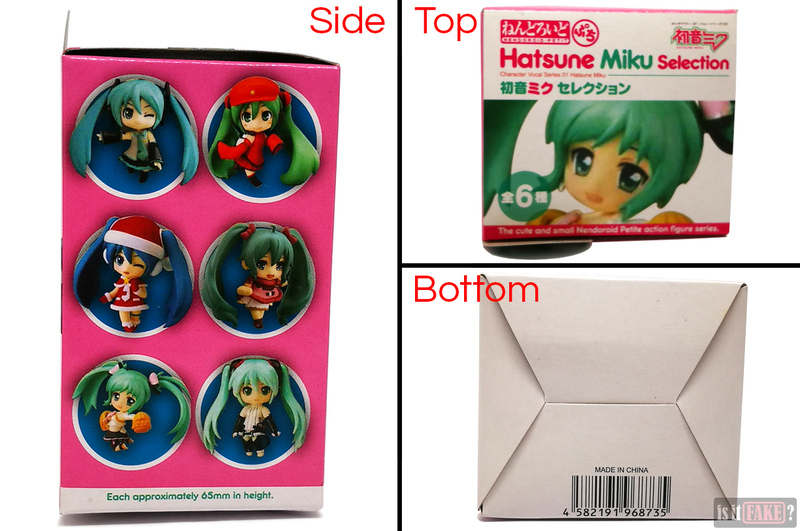 So there you have it: all six fake figures in one big box. 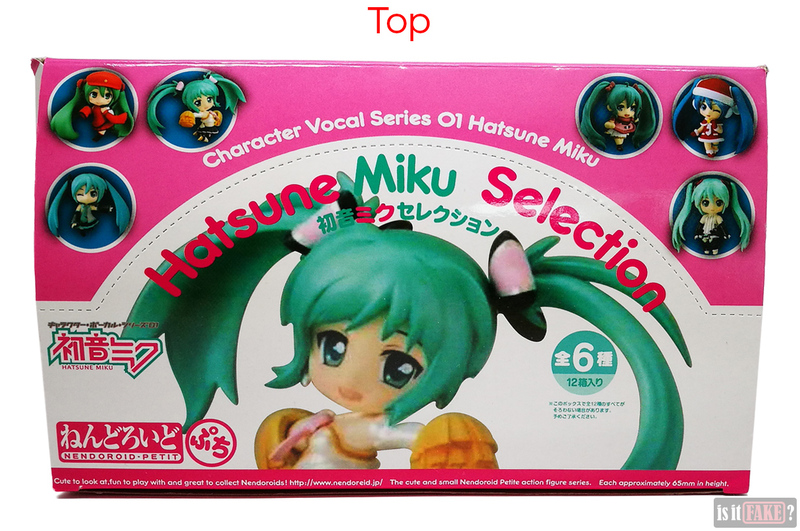 Before we proceed, it has to be stated that there is indeed a figure line called Character Vocal Series 01. 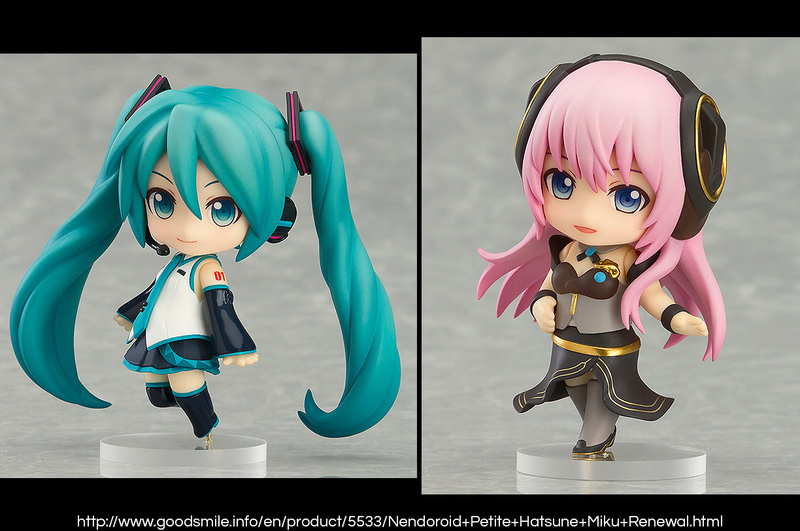 However, Good Smile Company never assembled these specific Nendoroid Petite Miku designs in one set. This was all the bootleggers’ doing, and they made a mighty terrible job of it too. 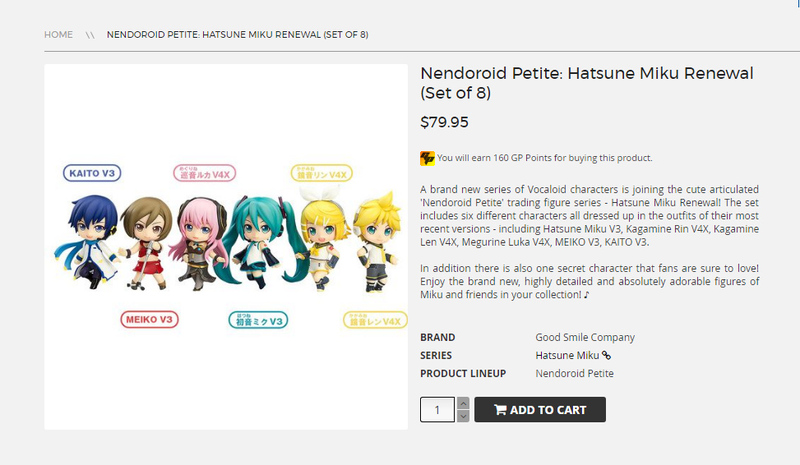 It’s true official Nendoroid Petite sets can be costly. 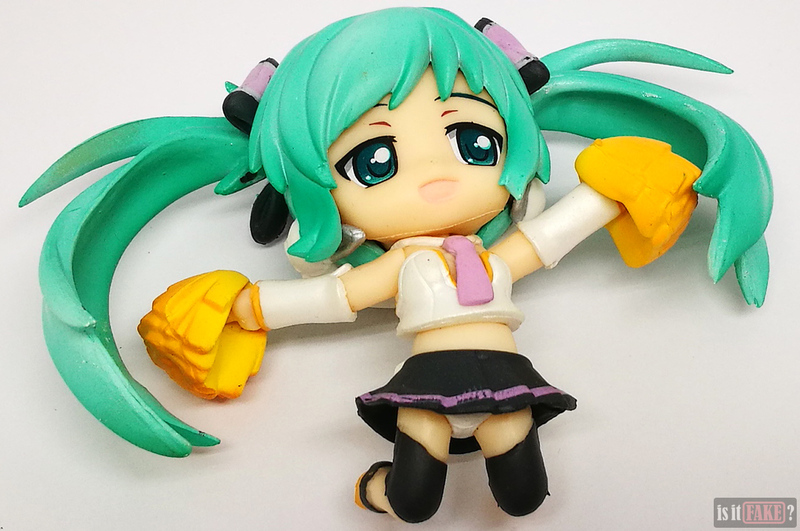 The good news is you get what you pay for, and for $64 and up, that means gorgeous premium figures you can proudly display to all your friends and loved ones. 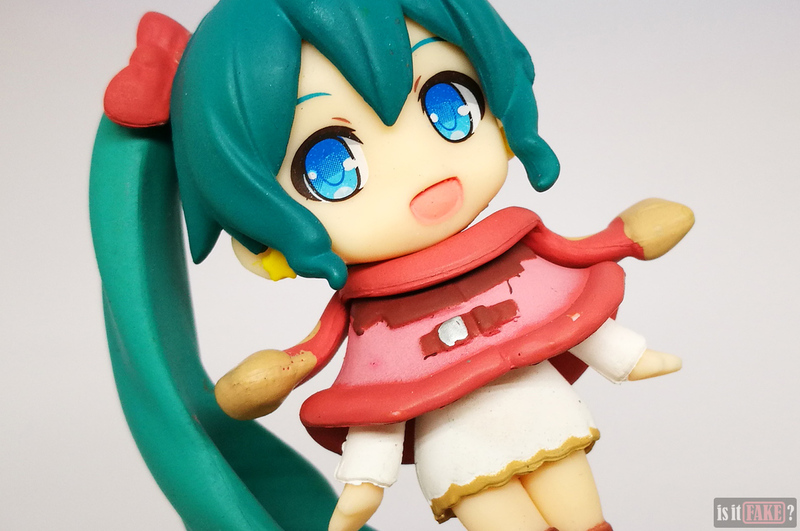 Good Smile Company has online stores (found here and here) where you can buy their products, from Figmas to Nendoroids to scale statuettes. Unfortunately, most older figures are no longer available in said stores. Thankfully, Good Smile Company provides an enormous list of their partner shops (both online and retail) categorized per country. Just click on this link to see said list. 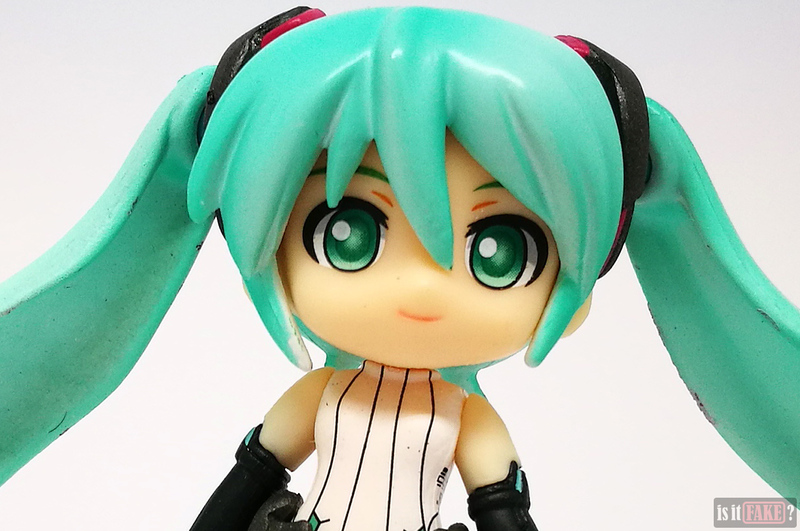 From many of these stores, you can purchase Good Smile Company’s official Nendoroid Petite: Hatsune Miku Renewal figure set. 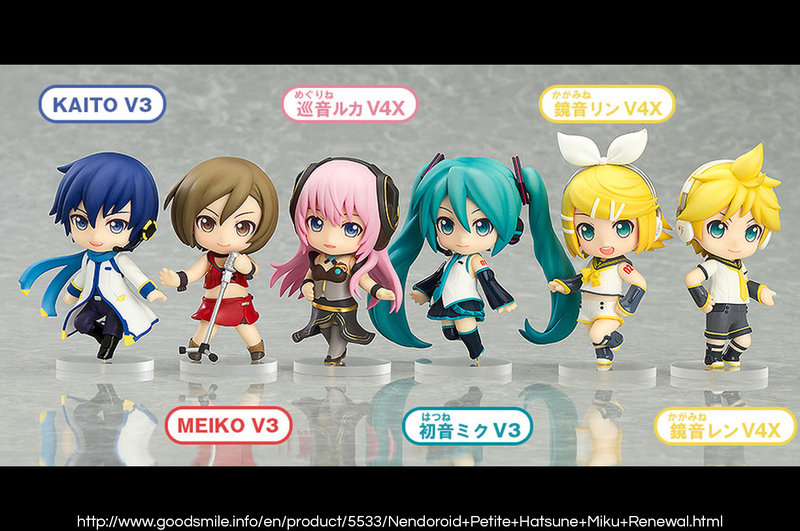 This consists of 7 figures: Hatsune Miku V3, Kagamine Rin V4X, Kagamine Len V4X, Megurine Luka V4X, MEIKO V3, KAITO V3, and a mystery figure. 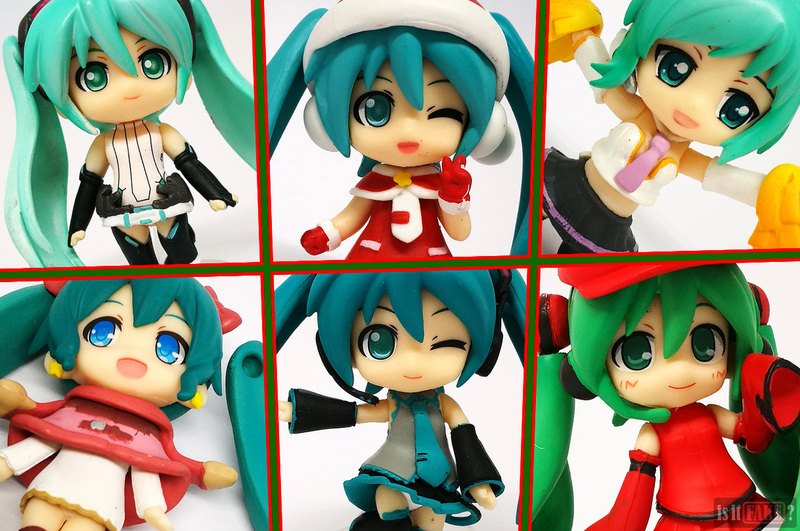 The entire set is available at Figurise for $80, Neko no Koe Shop for $100, and Figuya for $106. 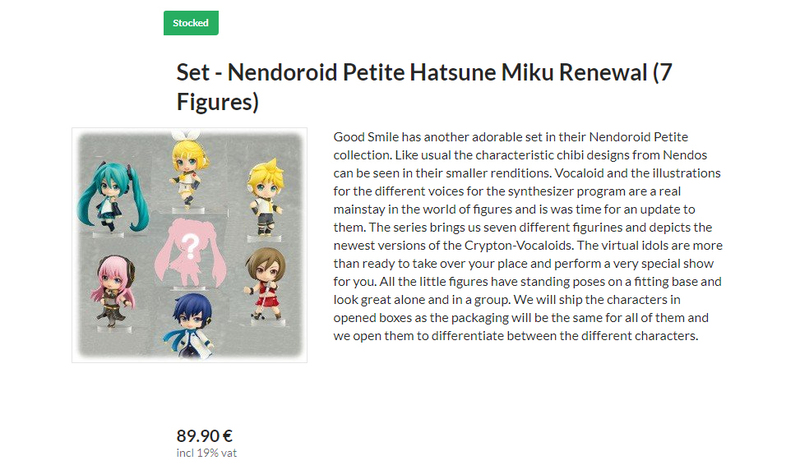 Alternatively, you can buy each figure separately. 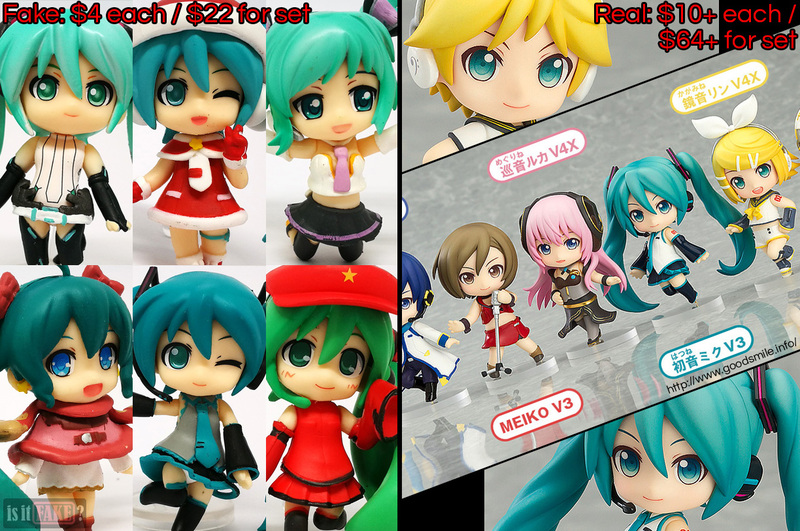 For example, each character in the set costs $16.5 at Figuya and $10 on Lunar Toy Store. 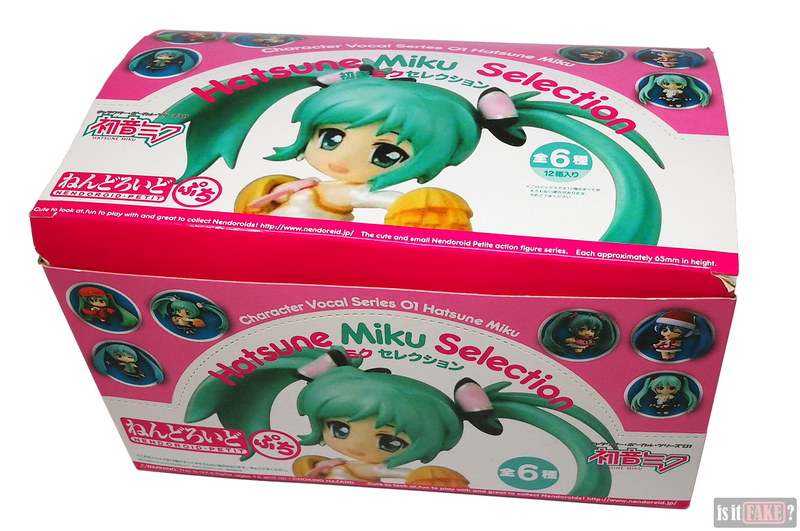 You can also buy the set from Amazon for $73 and AmiAmi for $64. 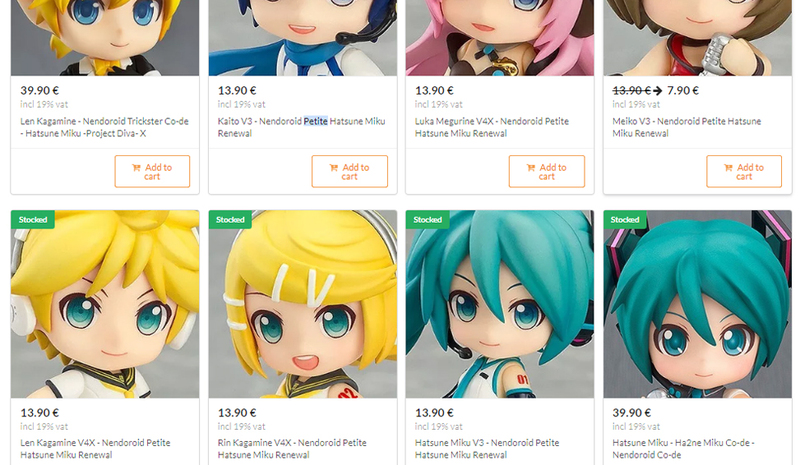 Hatsune Miku may be the flavor of the future, but this fake Nendoroid Petite Hatsune Miku Collection will leave nothing but a bad taste in your mouth. Each of the six figures in the set is a cluster of problems, from hideous paint applications, to shabby sculpts, to useless stands. Not to mention the packaging is aggravating in its deceptiveness. We give this set the present of an 85% terrible rating.